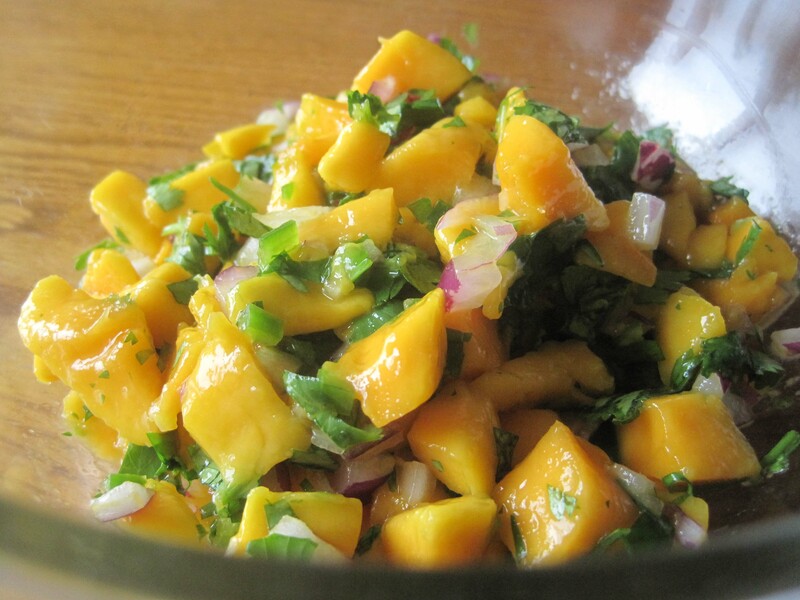 But over the years I kept coming across recipes calling for mangoes. They’re actually the most popular fruit in the world. Did you know that? Not here in the U.S., certainly. But there are a whole lotta people around the globe that love these peculiar, sweet, large-pitted fruits. I first fell in love with them when I had some Mango Sticky Rice at a block party downtown a few years ago. A very simple Thai dish of sweetened coconutty rice with slices of mango served on top – it’s one of my favorite side dishes to bring to a party for it’s ease of prep and “wow” factor. I had actually planned on doing a whole bunch of recipes with mango since I bought a crate of beautiful Champagne Mangoes at Sam’s Club last week. Also known as Atualfo Mangoes, they are smaller and have a softer, less fibrous texture than the regular ones. So anyway, here is my new favorite thing to do with them. Great for parties, healthy, easy to prepare, and impressive to folks used to eating boring old tomato salsa out of a jar. 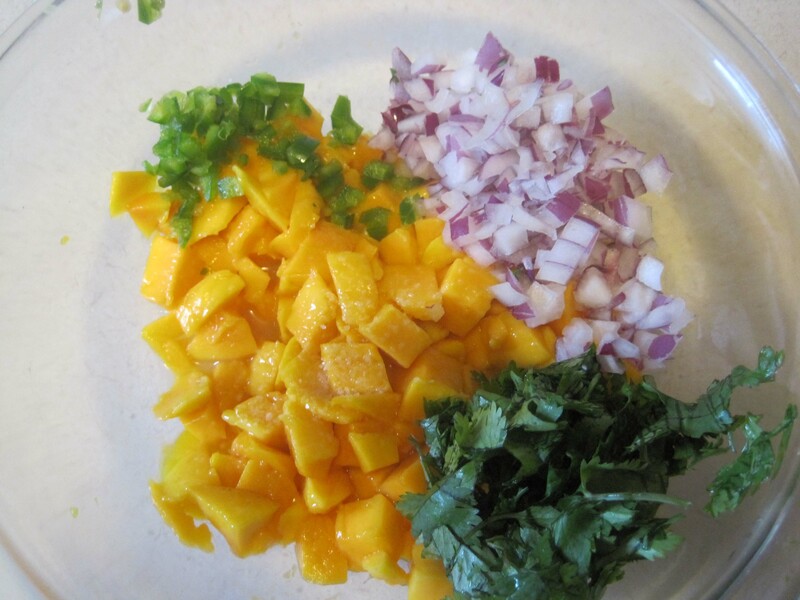 Here are the elements – 3 ripe Champagne Mangoes (or 2 of the bigger ones), pitted and chopped (we’re just going to pretend that my mangoes are not on the verge of going bad…), some finely chopped red onion (about 1/3 cup – not a whole onion), a handful of fresh cilantro, half of a jalapeno pepper (or a whole one if you like things really hot), seeded and finely minced, 1 Tbsp lime juice (or the juice of one fresh lime), and a good size pinch of salt. 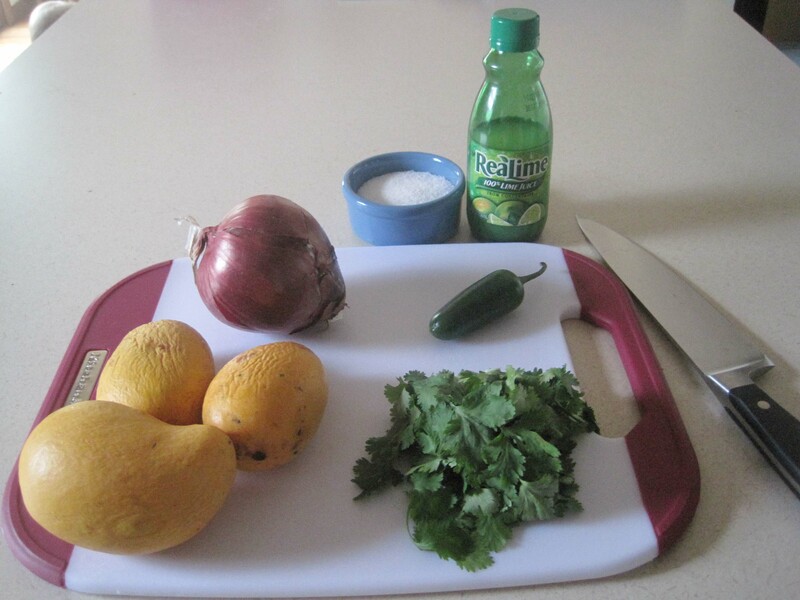 Here is a video showing one method for cutting a mango. Also – remember to handle jalapenos with great care. Wear gloves if you have them. Just a little bit of juice in the eye will burn for hours. 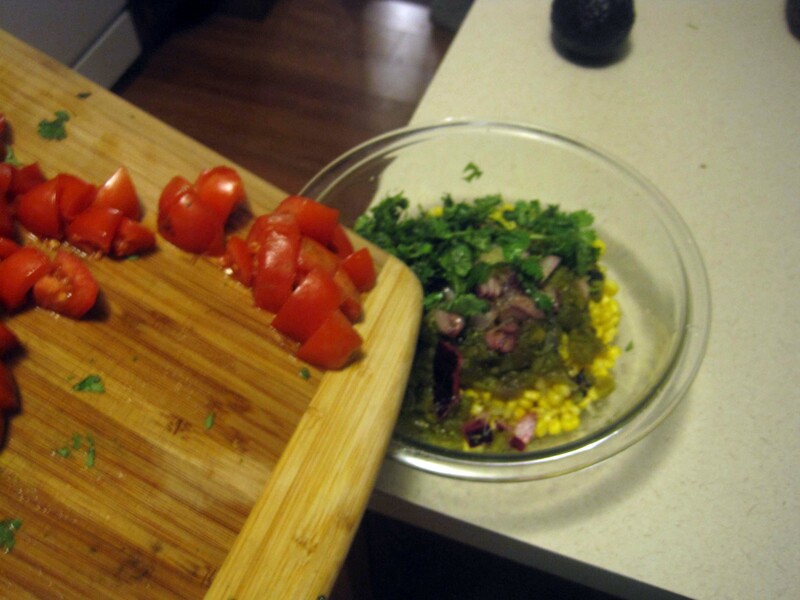 Chop and mix it all up and you have a fresh, wonderfully flavorful salsa. It’s sweet, spicy, refreshing, and goes magnificently with salty tortilla chips. It may just make a mango convert out of you. 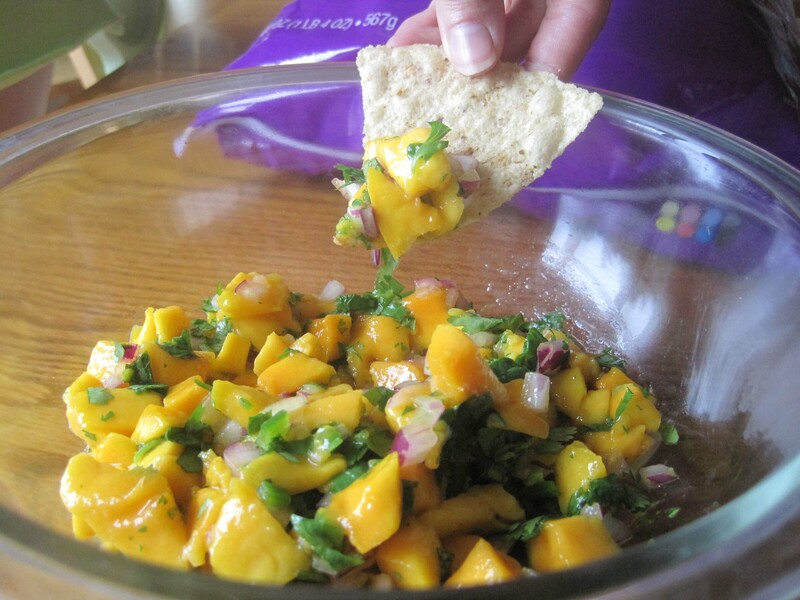 Mix and serve at room temperature with tortilla chips. Filed under Party Fare, Sauces, Condiments, Dips etc. Here in NW PA we had the most beautiful March ever. Weeks of summer-like temperatures following the mildest winter anyone alive can remember. So this April – with it’s very normal, seasonal weather – it’s been kind of a drag. My longing for warmer weather lead me to these little beauties. Combining the flavors of banana, coconut, lime, and good ol’ Caribbean rum, they remind me of our cruises we took so very long ago. The banana in the cake makes it sturdy enough to pick up and eat like a cupcake. 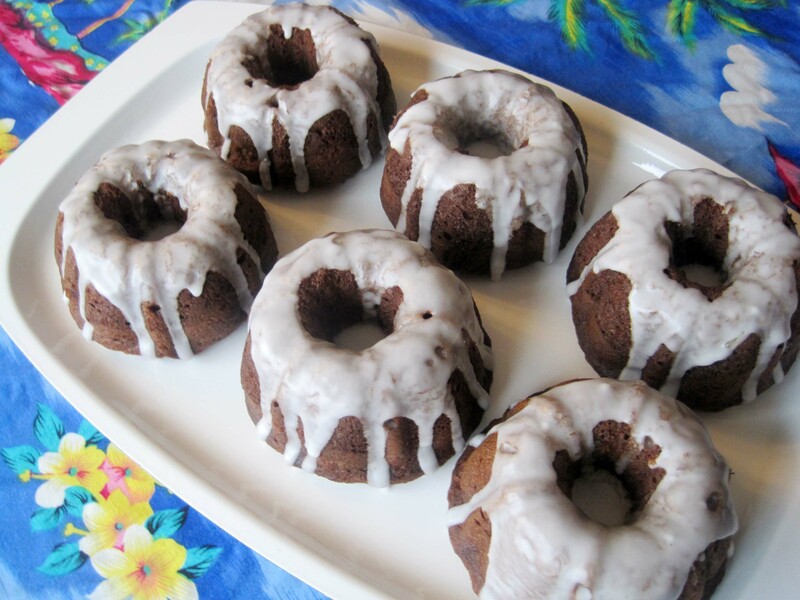 These little bundt cakes are moist and fragrant and pretty enough to put out for company. 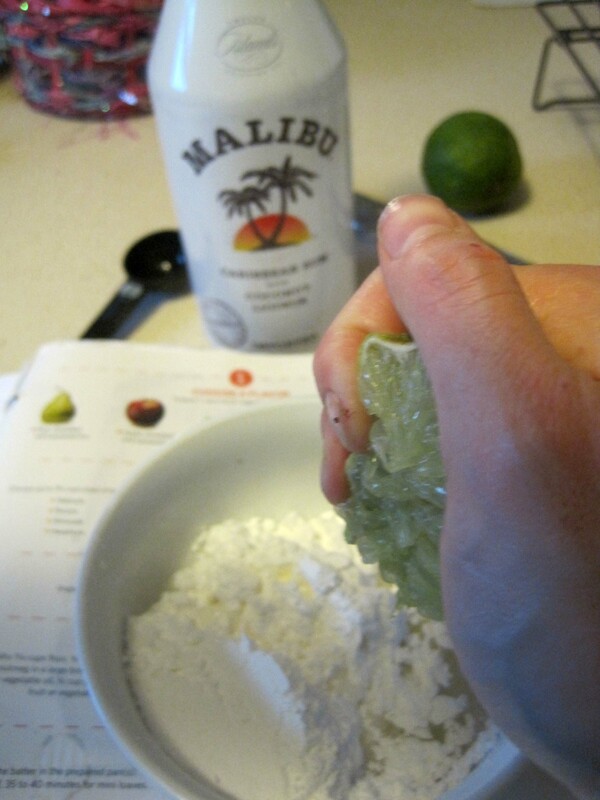 One quick note on the rum – I used a small amount of Malibu Coconut Rum in the glaze. You don’t have to. You can use milk if you like. There is some disagreement in the GF community as to whether or not distilled liquors are truly gluten free. The general consensus seems to be yes, they’re okay, but many celiacs choose not to consume them to be on the safe side. This is pretty much what the Malibu FAQ says as well. 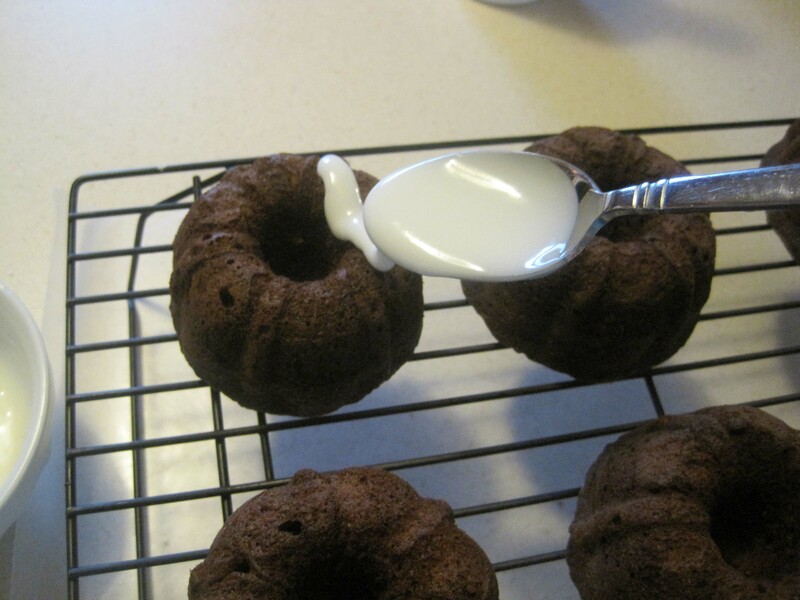 I used my mini Bundt pan but if you don’t have one of these you can use a cupcake pan. It should make about a dozen. Zest a lime into the bowl. Save that lime. You’re gonna need the juice in a minute. And crack in two eggs. 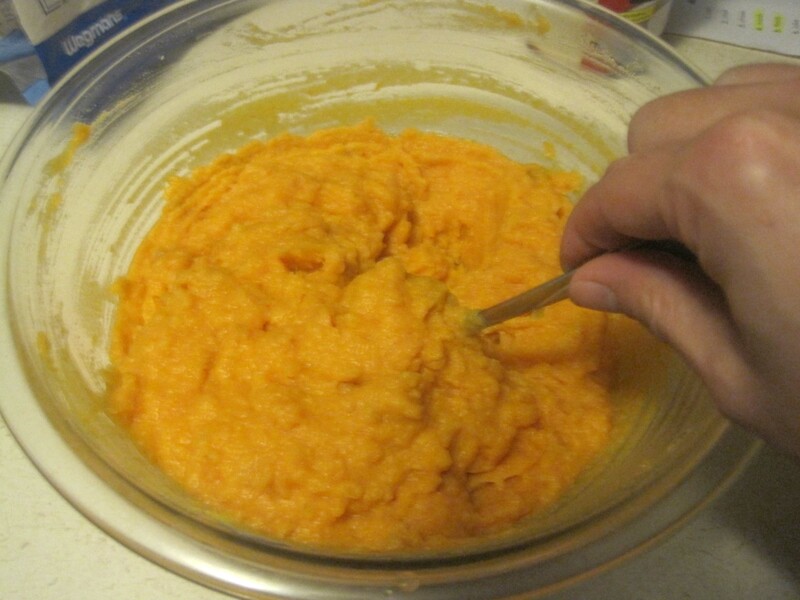 Mix it all up (or puree like I did). Next, in a large bowl (or the bowl of your stand mixer – as apparently I was feeling uber lazy this morning), measure out 200 grams of flour. See those digits?!? This was literally every single gram of flour I had ready made. This made me soooooo happy. I thought I was going to have to make some more of my GF flour blend but I had just enough. Of course if you don’t have to worry about gluten then by all means, use regular flour. 200 grams of regular flour is a scant 1 1/2 cups. 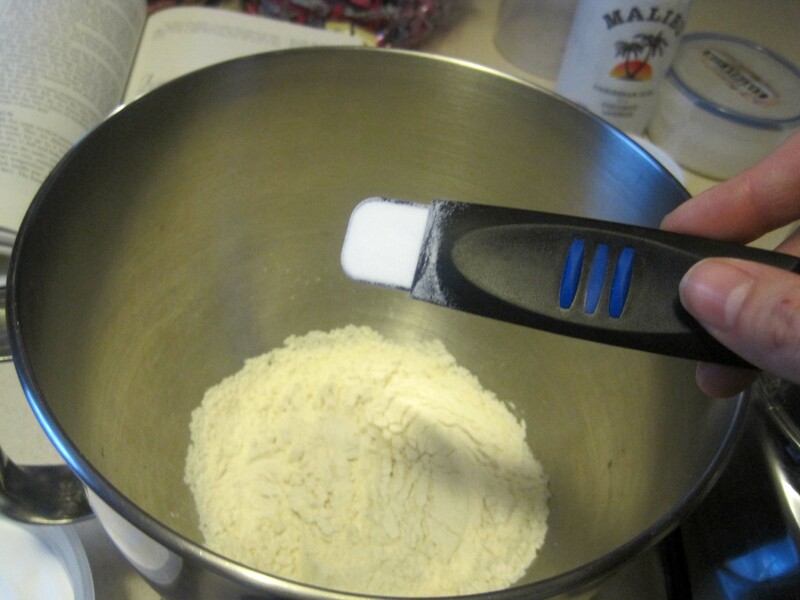 To your flour, add 1 tsp EACH baking powder, baking soda, and xanthan gum (only if using GF flour). 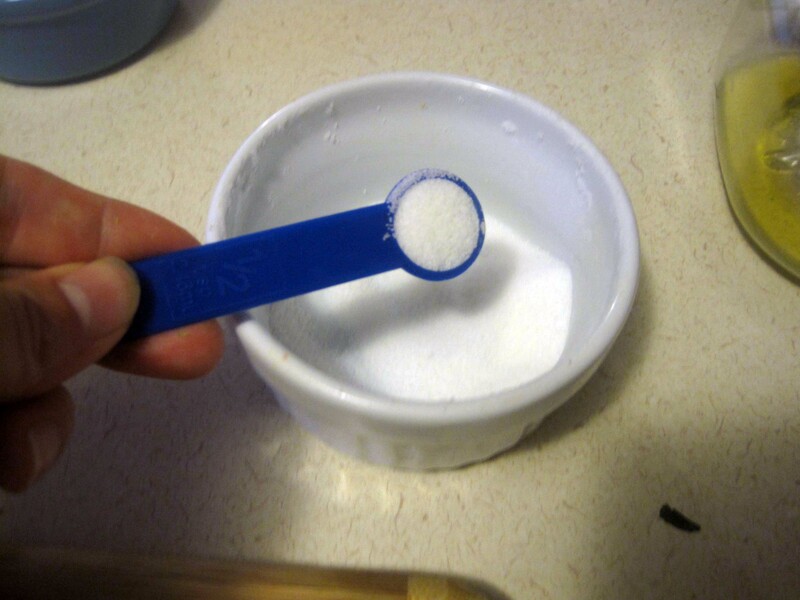 Add 1/2 tsp salt. This is my cool new sliding measuring spoon. 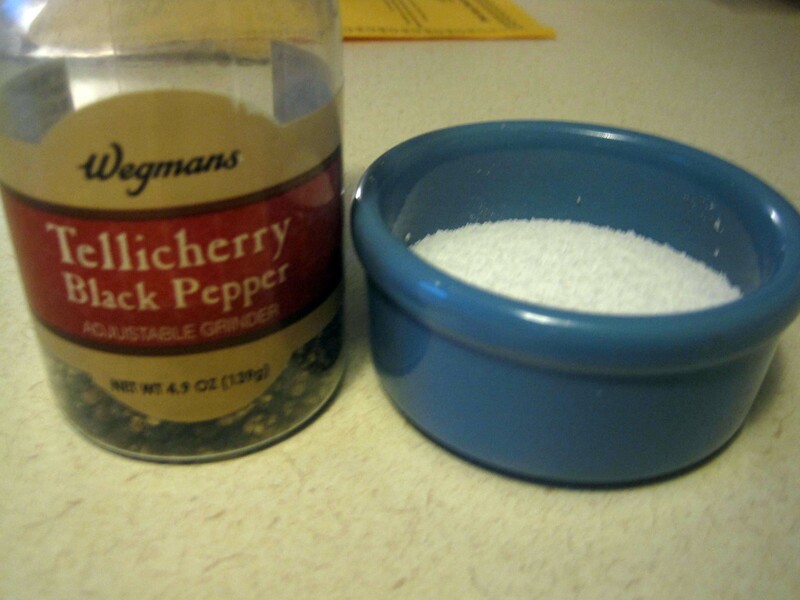 I love it for dry ingredients because I don’t have to dirty every spoon in the drawer. 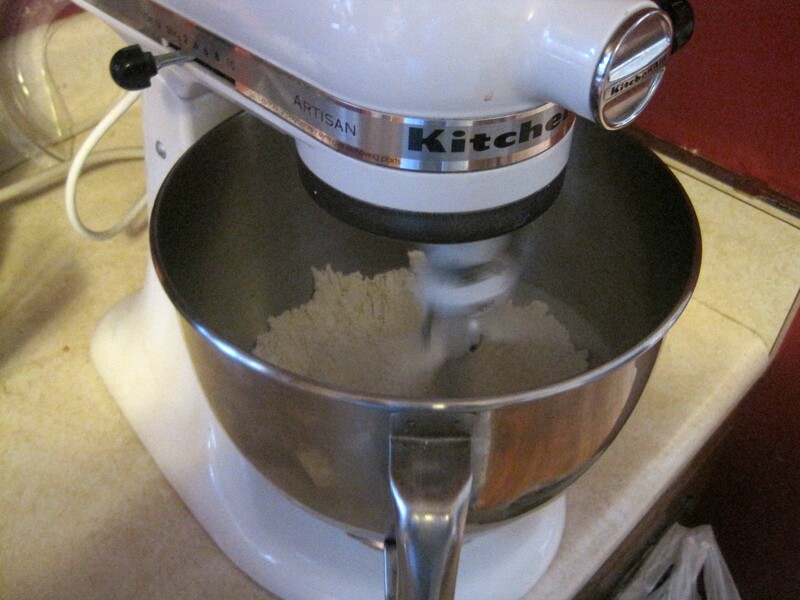 Whisk that all up or turn your stand mixer on low and let it go for a minute to homogenize and aerate it. 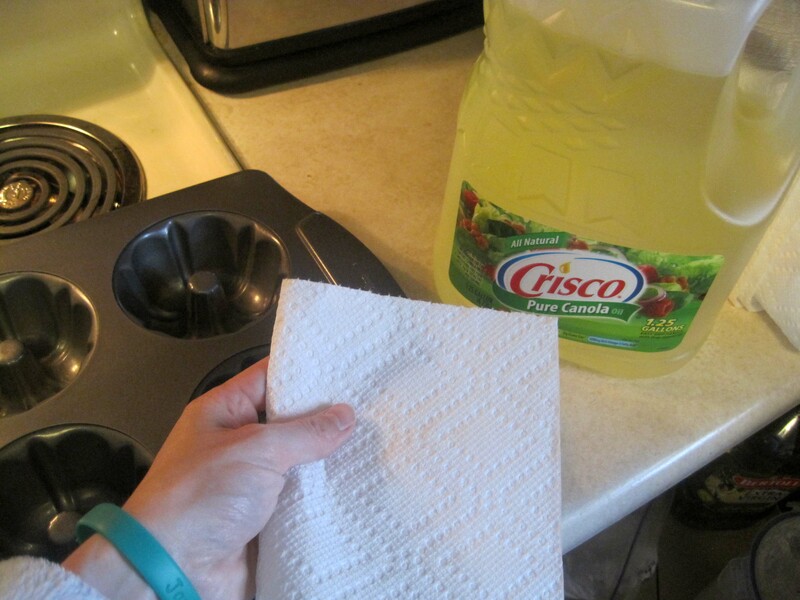 While that’s going, grab a paper towel and wipe down the cavities of your pan with oil. I’m not a fan of Pam. It gets all up in the air and settles on everything in the kitchen. This does just as good of a job and only takes a few seconds longer. 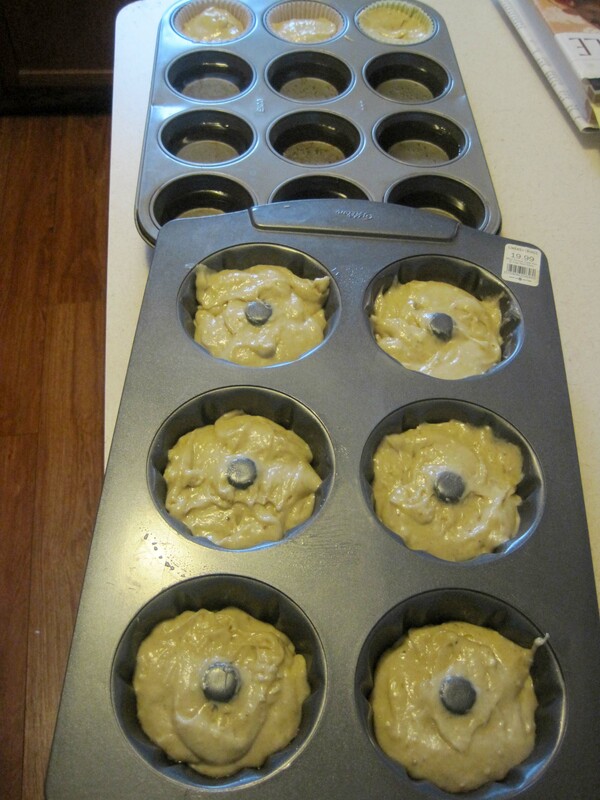 Just make sure you get into all the ridges so your cakes come out cleanly. …and drizzle in the banana mixture. Turn the mixer up to medium speed and run for a minute or so. 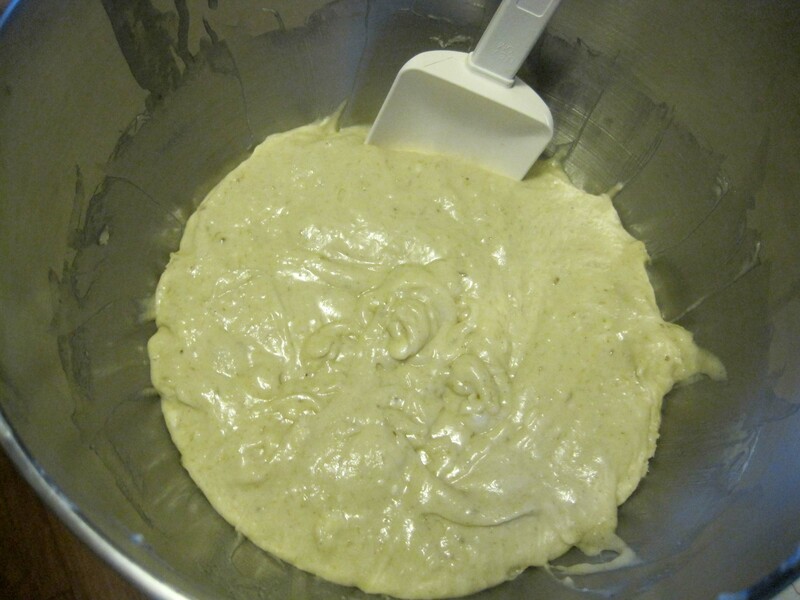 …until the mixture is smooth and uniform like this. Pour batter into the wells of your pan. 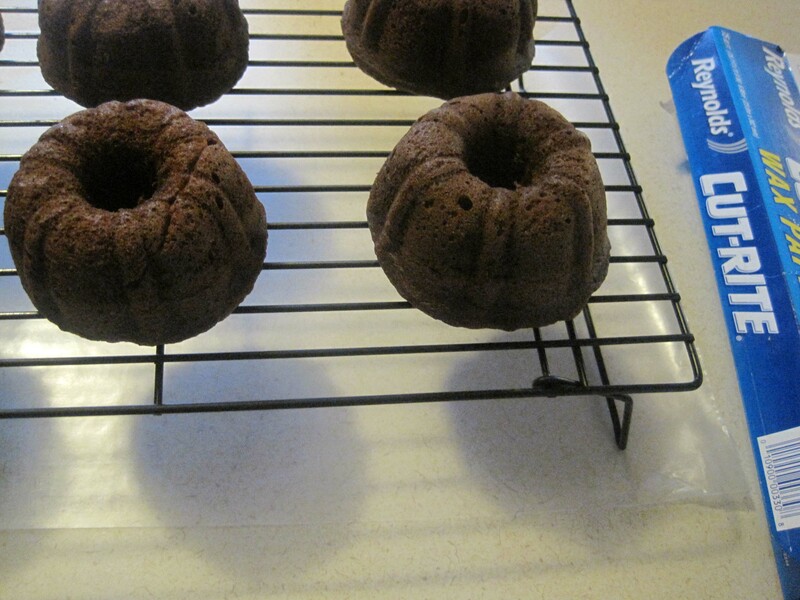 If you only have one mini Bundt pan like I do you can either do this in two batches (this recipe makes 9 cakelettes), or you can make cupcakes out of the remainder like I did today. I filled the empty wells with water. Supposed to promote more even baking. Or something. I’m honestly not sure. Pop these in the oven at 350 degrees. Cupcakes take about 22 minutes in my oven. The cakelettes take more like 32. Here they are straight out of the oven. Don’t worry if there’s no hole in the middle anymore. That will make for a nice glaze catch in a minute here. Speaking of glaze, let’s do that now. In a small bowl, mix 1 cup of powdered sugar, 1 Tbsp Coconut Rum and 1 Tbsp lime juice. Stir that up. The glaze should be very thick but still pourable. 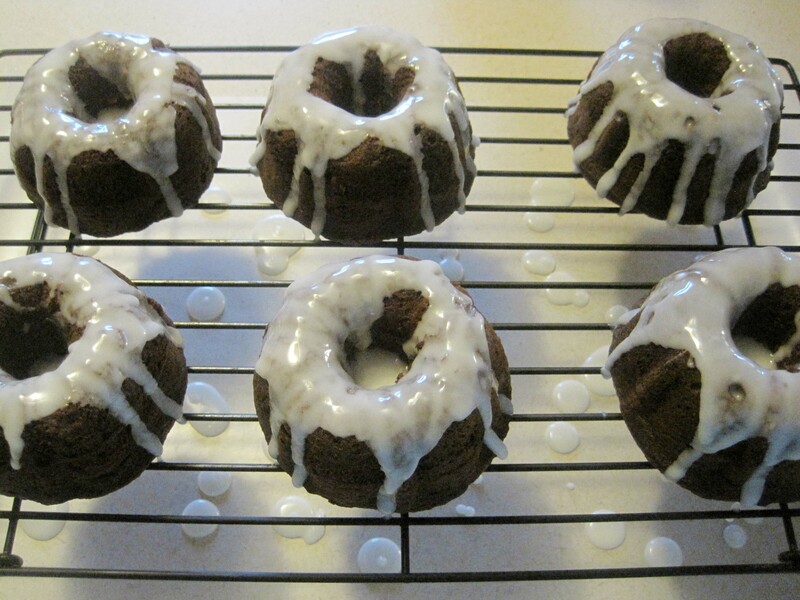 …and drizzle glaze over the tops of the cakes. Trust me, you don’t have to try to coax it to drip down the sides, it will do that on it’s own. It’s possible I maybe didn’t wait until the cakes were totally cool. Maybe. Which made my glaze drippier than usual. No matter. Clean-up’s easy since we put the wax paper under the rack first. The coconut is a background player on this one. Subtle, but definitely there. If you wanted a stronger coconut flavor you could easily toast some sweetened shredded coconut and toss it on top of the still sticky glaze. That would be very pretty as well. And there we have it! Soft, sweet, tender banana cake, complex with the flavors of the coconut and the lime and the rum. 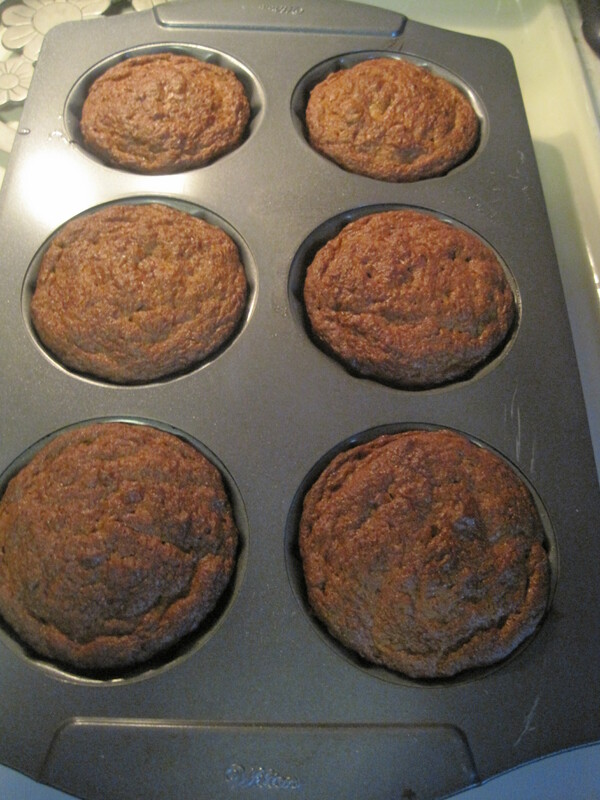 So yummy and so not your standby wintertime baked banana fare. Because we’re dreaming of warmer days…. Coat a mini-bundt pan with oil, making sure to get it in all the ridges so the cakes won’t stick when you go to get them out. In a small bowl (or in a food processor) whisk together the mashed bananas, sour cream, cream of coconut, sugar, lime zest, and eggs. 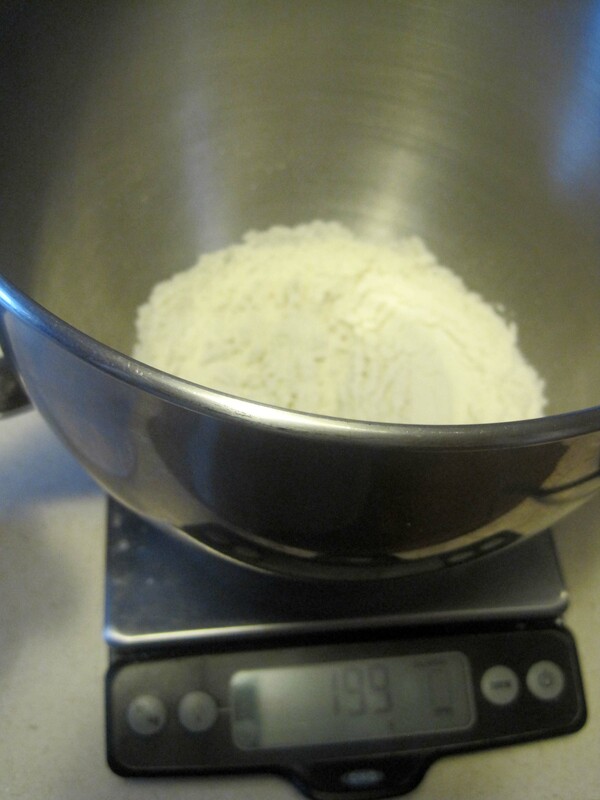 Measure 200 grams flour into the bowl of a stand mixer. 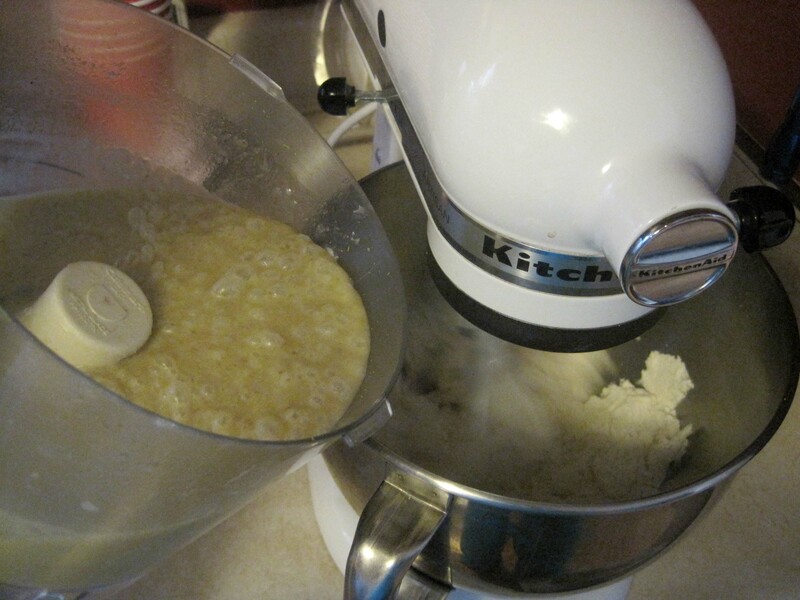 Add the softened butter and turn the mixer on low. 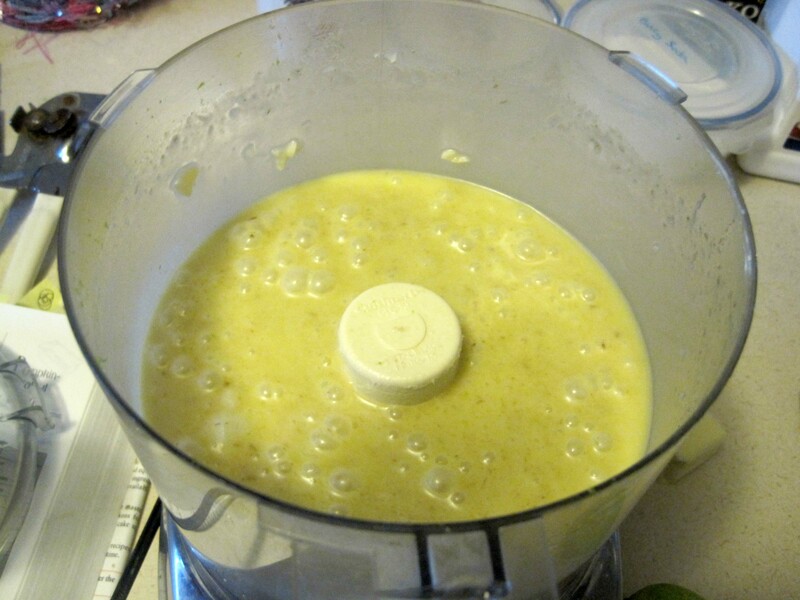 Drizzle in the banana mixture until moistened then turn the mixer up to medium. Let run for a minute or so until smooth and uniform. Fill each cavity about 2/3 full. This recipe makes 9 mini-cakes so if you only have one pan you can either do this in two batches or bake the remainder as cupcakes. Bake 30-35 minutes. Remove to a cooling rack and allow to sit 15 minutes. 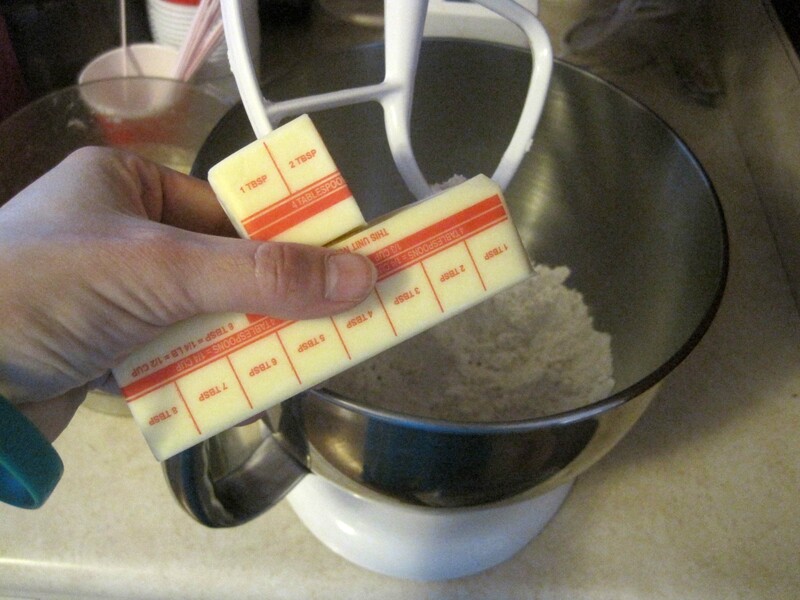 Use your fingertips to ease the cakes out of the pan. Allow to cool completely. Make your glaze. In a small bowl combine the powdered sugar, coconut rum, and lime juice. Drizzle over cooled cakes. So, it’s the middle of January which I’m guessing means most of you are either on a diet or a new exercise kick or both. Sound about right? I don’t get why January-March is the high season for the fitness industry and weight loss initiatives in general. It’s January. It’s cold and dark and we’re just trying to get through the winter until the real rebirth happens in the spring. I mean, don’t get me wrong – as a fitness professional I’m always glad to see paying customers coming in our doors with determination on their faces and water bottles in hand. What irks me is the annual eventishness of it. I mean, I think we all recognize this time of year as being the time we “get back on track” and join a gym and start eating healthy. But all that enthusiasm goes hand in hand with the shrug and a laugh knowing all too well that it will be over in a few weeks and we will all go back to life as usual until next New Year’s resolutions roll around. That being said, I’m still game for lighter entrees as long as they’re satisfying in the mental/emotional arena. So today we have a salad – a filling, satisfying, not totally non-caloric salad. It could be really light fare, if you really wanted it to be. But take away the (really good for you) avocado, the (already lite) sour cream and the fried tortilla and you’ve lost the appeal of the salad. And without the appeal you have lost the mental game entirely. And the game IS mental. Try to lose weight while feeling like you’re depriving yourself all the time. It doesn’t work. This salad is (relatively) healthy while still being completely mouth-wateringly awesome. Can’t ask for more than that. Is there anyone out there who doesn’t love a great taco salad? No? I didn’t think so. This isn’t exactly taco salad. Not what I think of as “traditional” taco salad anyway. It’s so much better. First we’re going to start with a marinade. 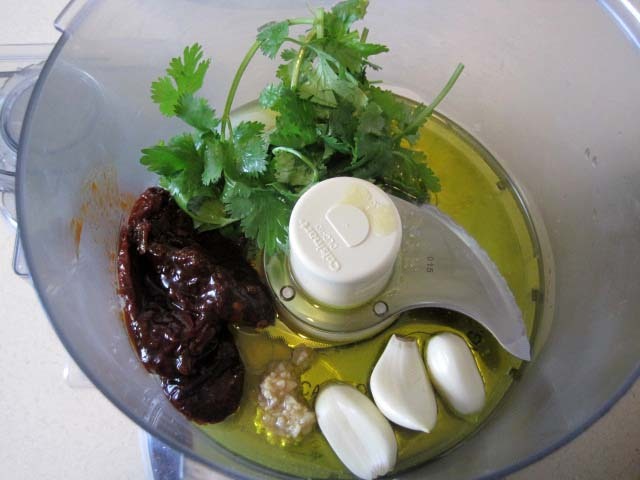 In a food processor combine 4 cloves of garlic (one of mine came from a jar – shhh! ), 2 chipotle peppers in adobo sauce (the kind you get in a can in the Latino aisle), a handful of fresh cilantro, 2 Tbsp lime juice, and 1/4 cup olive oil. Pour the marinade into a ziplock baggie with 1 lb of well trimmed sirloin steak. Make sure the entire steak is covered in marinade and set in the refrigerator for several hours or overnight. I just had to show you. I got a NEW KNIFE!!! A genuine Wusthof! This is really big exciting stuff (for me). 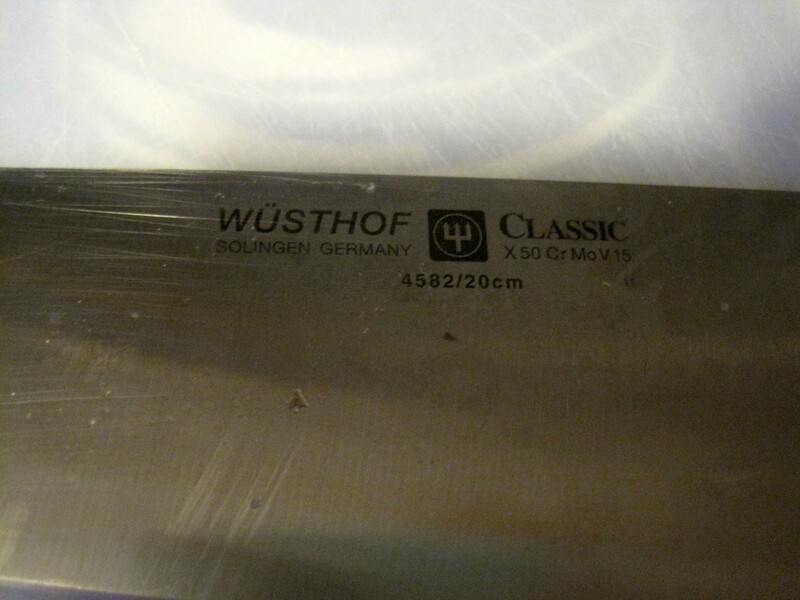 It’s soooo much sharper than my old knife it makes me giddy every time I use it. Get your steak out of the fridge and let it sit while you prep your vegetables. 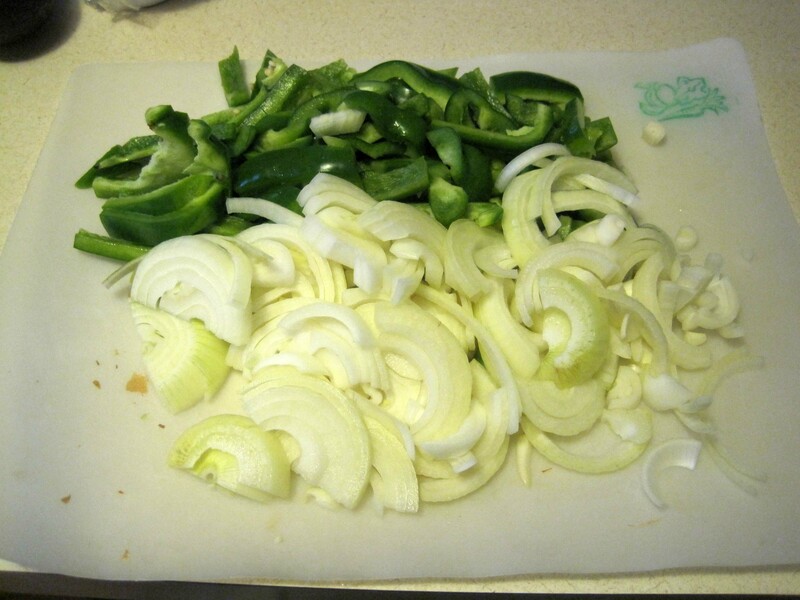 With your chef’s knife, chop up some green bell pepper and some onions. I used cooking onions but Spanish Onions or any sweet onion would be awesome too. I think I’ve got 2 peppers and 3 onions there. I was going for equal parts of each. …until they look like this. Soft and lovely. Season with kosher salt and remove from the pan. While the peppers and onions are cooking we can start prepping our other salad ingredients. 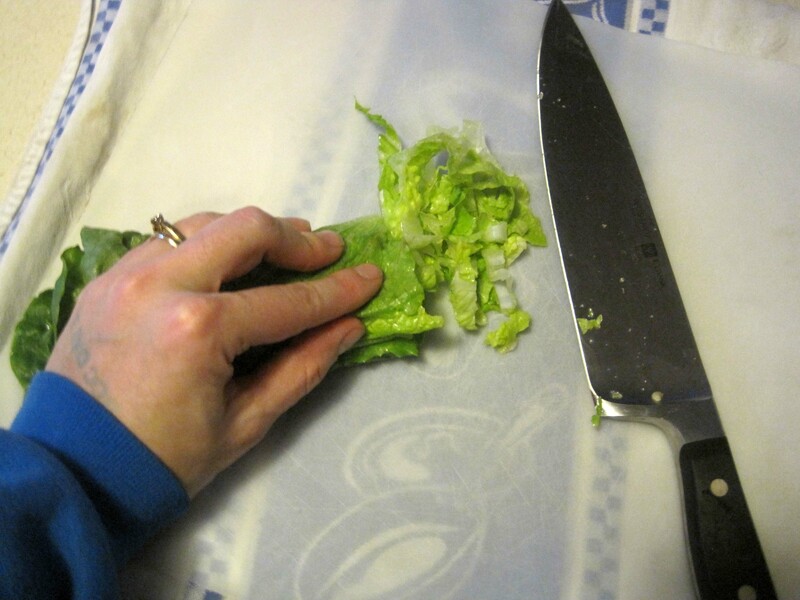 Roll up some romaine lettuce and slice it into thin ribbons. 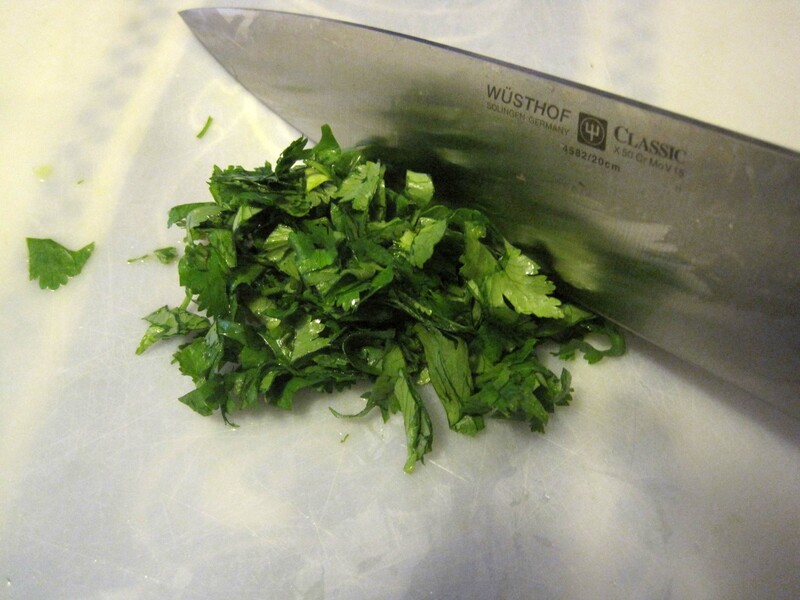 Chop up some more cilantro. 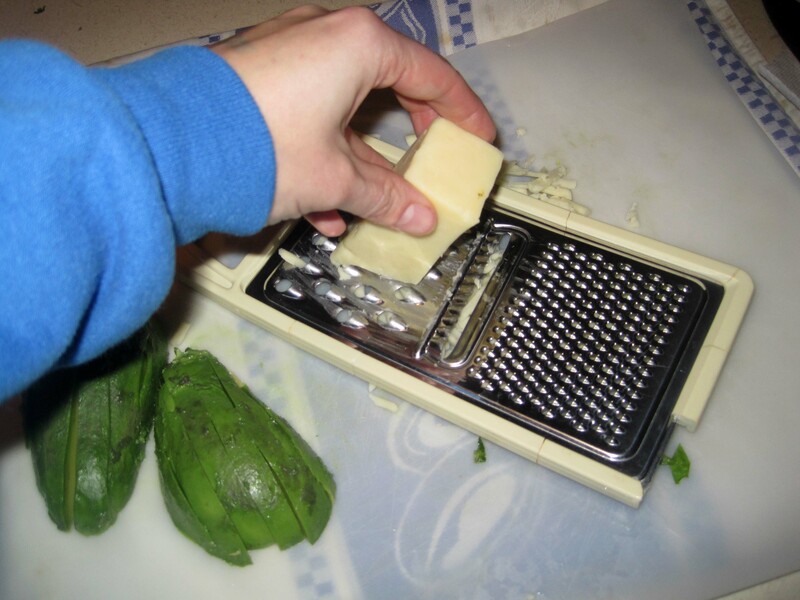 And slice up an avocado. Isn’t my avocado perfect? I love it when I open them up on their perfect day. 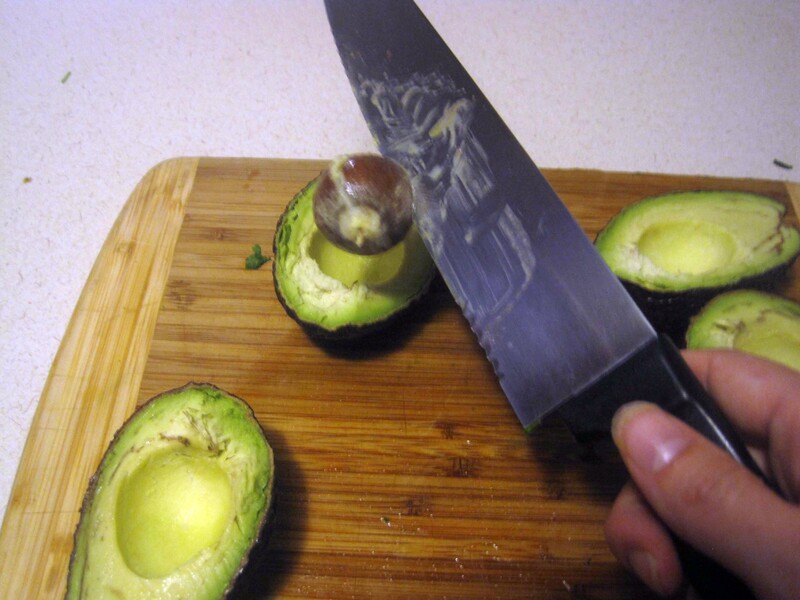 To easily remove the pit, carefully whack your knife into the pit, exert a little pressure and rotate it out. 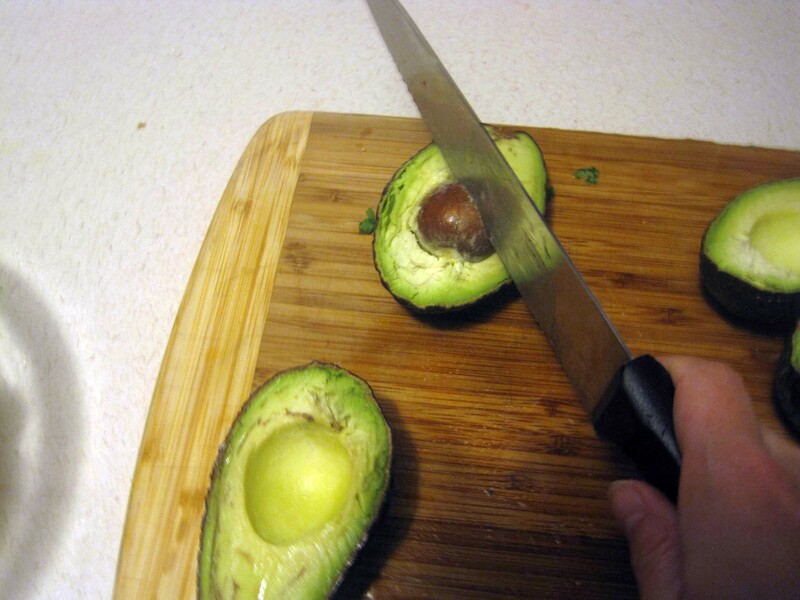 Then use a spoon to carve the avocado out of it’s skin. Shred up some Monterrey Jack cheese. Obviously don’t shred your cheese like this. I need a third hand. Add to the list some jarred salsa and lightly salted sour cream and our salad is almost ready to be assembled! But of course we can’t forget our steak! 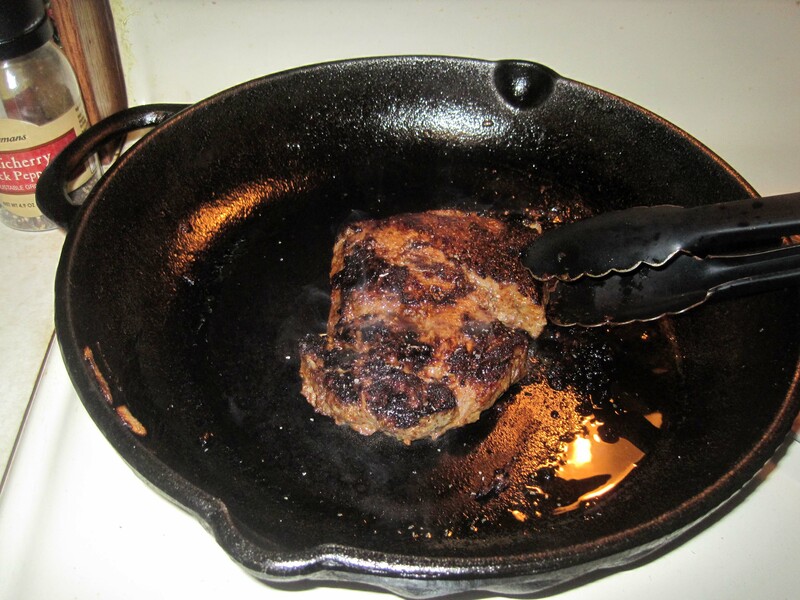 This is best done in a cast iron skillet if you have one. They retain heat better than any other type of pan and are awesome for searing meats. On Medium High heat, sear your steak for 3 minutes per side. Turn off the heat and let it sit in the pan. 8 minutes will get you a perfect medium rare. At least, in a cast iron pan it will. If you’re cooking your steak on a different surface that time might need to be extended slightly. And of course, if you prefer your steak more well done, leave it in longer. Never cut into a steak to check for doneness, that causes all the juices to run out everywhere. I always use the thumb test to test meat’s doneness. Here is a video showing the technique. Lastly, once you’re satisfied that your steak is done to your liking, leave it the heck alone! For 10 minutes to rest that is. Again, so all the juices don’t run out all over the place leaving you with a dry steak. Now, while the steak is resting, grab a small pan and fill it with a puddle of oil. I’m not sure how much I have in there. Many several tablespoons, put it that way. Enough to make a shallow pool. Heat the oil over Medium High heat until shimmery. 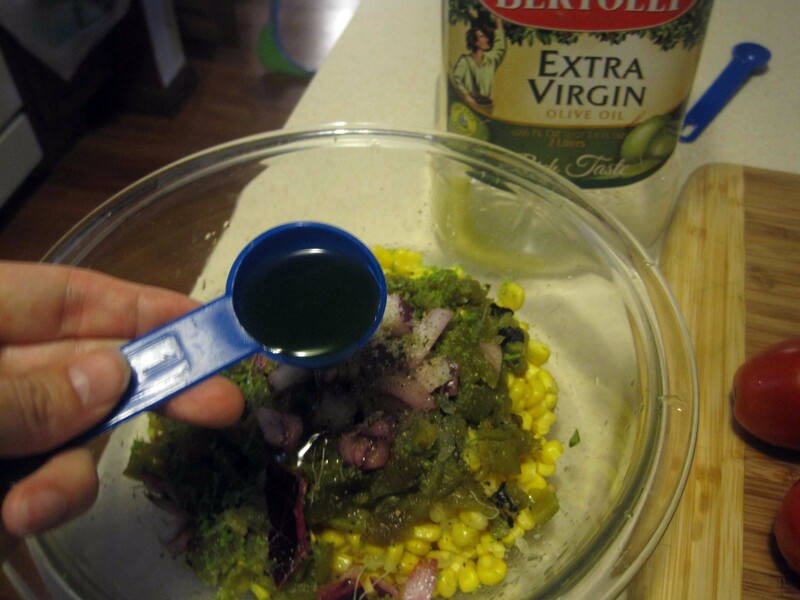 Grab some corn tortillas and place one in the oil. 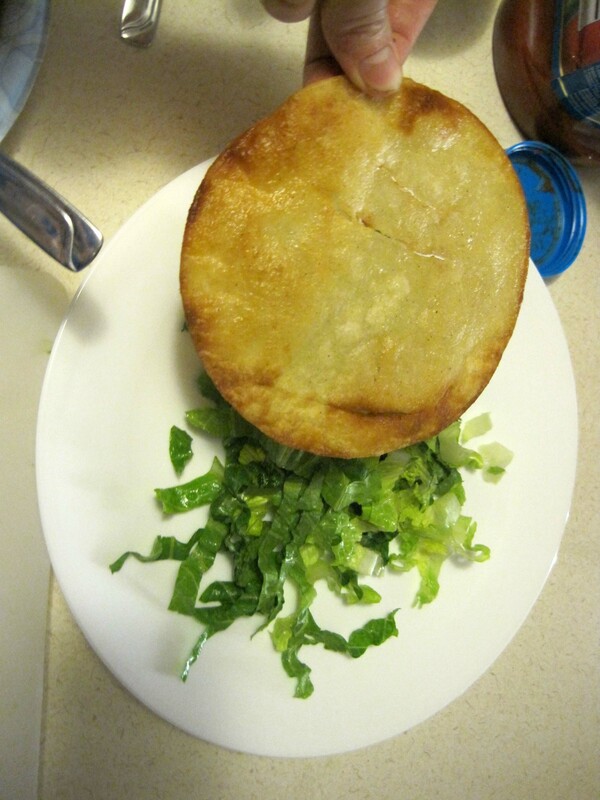 The oil should bubble excitedly when you introduce the tortilla. If it doesn’t, the oil isn’t hot enough yet. 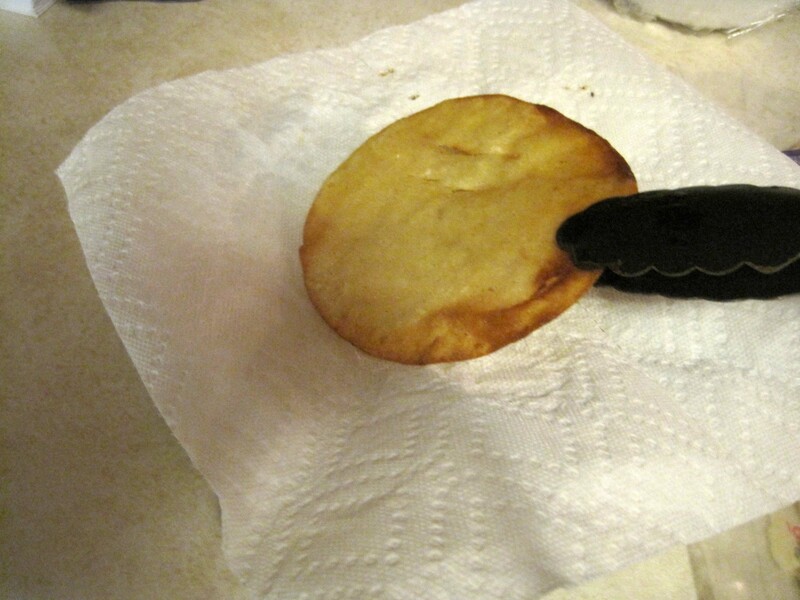 Fry each tortilla about 45 seconds to a side, or until it gets to be a nice golden brown. Oops. Don’t walk away and tend to children during this part. It’s not difficult but you really can’t walk away for two minutes in the middle of it. It’s been 10 minutes so I’m thinly slicing up my steak now. Eeeee! I left mine in for about 9 minutes and it came out somewhere between medium rare and medium. 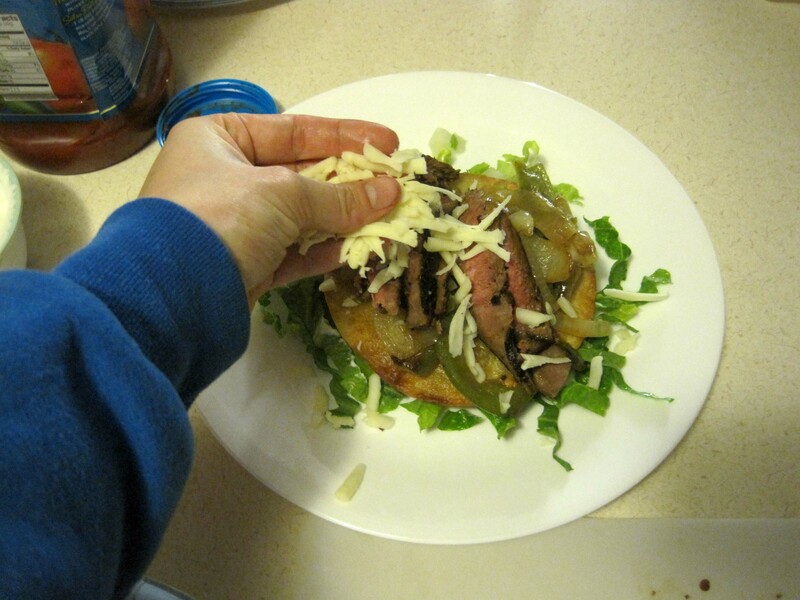 …then pile on some of the onions, the peppers, and the steak. Eeeeeee! Can you tell I LOVE steak? Sprinkle on some of the cheese. And top with a couple slices of avocado, a dollop of sour cream and salsa, and some cilantro (if you’re not a zombie like me and forget to put it on). 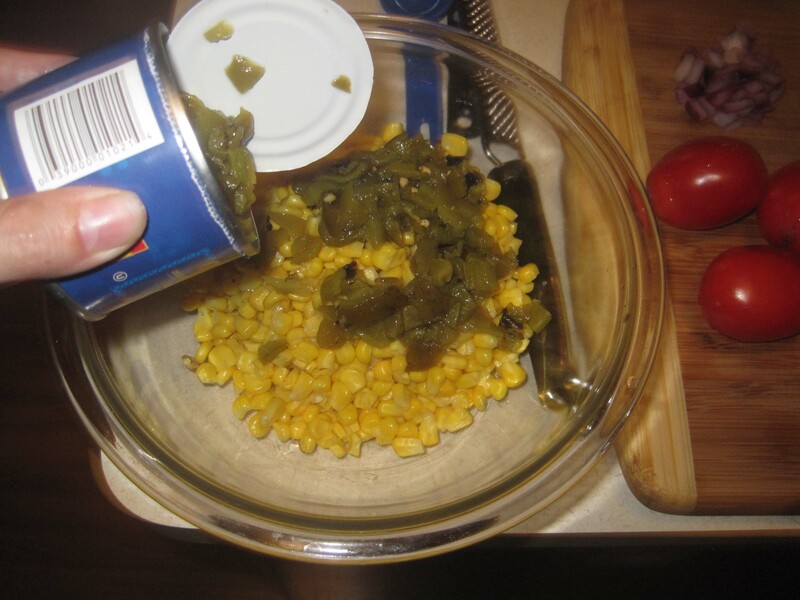 An alternative to the sour cream and salsa is to mix the two and use that as your dressing. 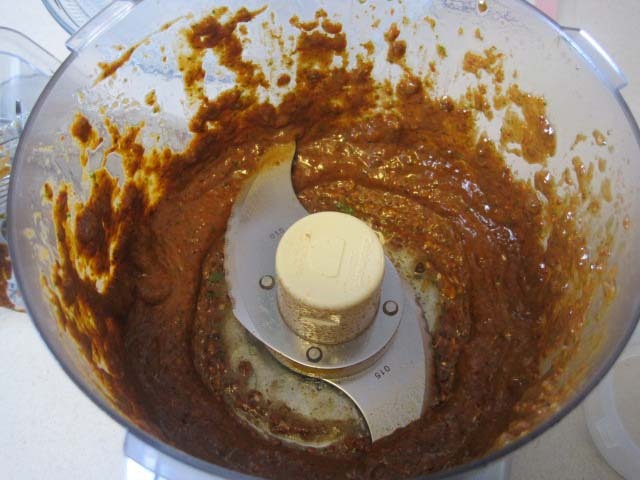 Or mix ranch and salsa to make a southwest dressing. All good options. Mmm. 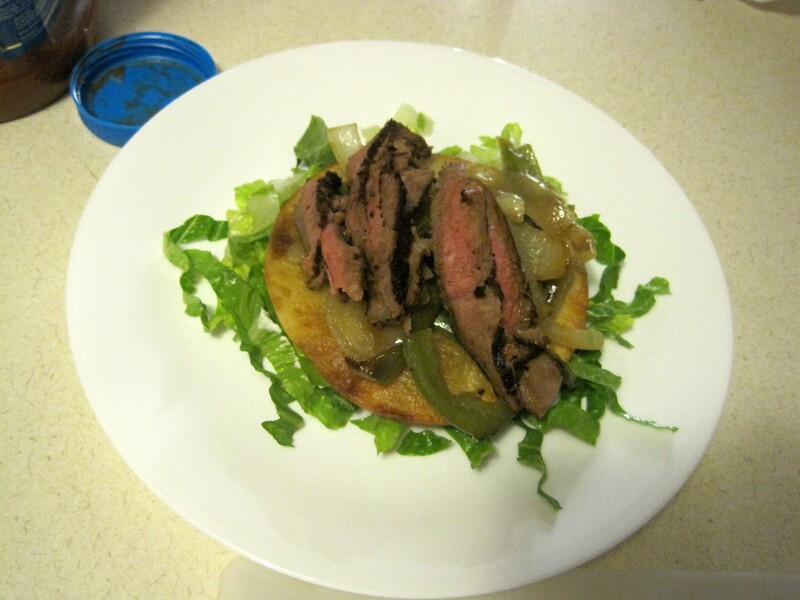 Just writing about this makes me want to fix it for dinner again tomorrow night! Soooooo ridiculously yummy. The garlic/chipotle/lime/cilantro marinade packs a punch and puts the whole thing over the top. In a food processor puree garlic, chipotle peppers, the handful of fresh cilantro, lime juice, and olive oil until smooth. Pour into a ziplock baggie and add sirloin. 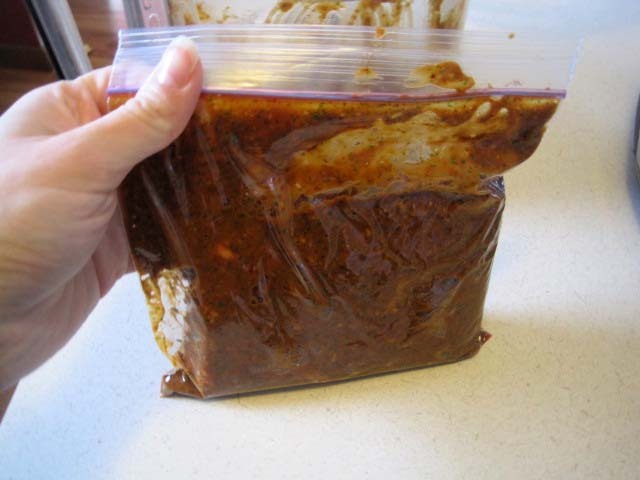 Put in refrigerator for several hours or overnight. Remove steak from refrigerator and set out while you prep your other ingredients. Prepare onions and peppers. 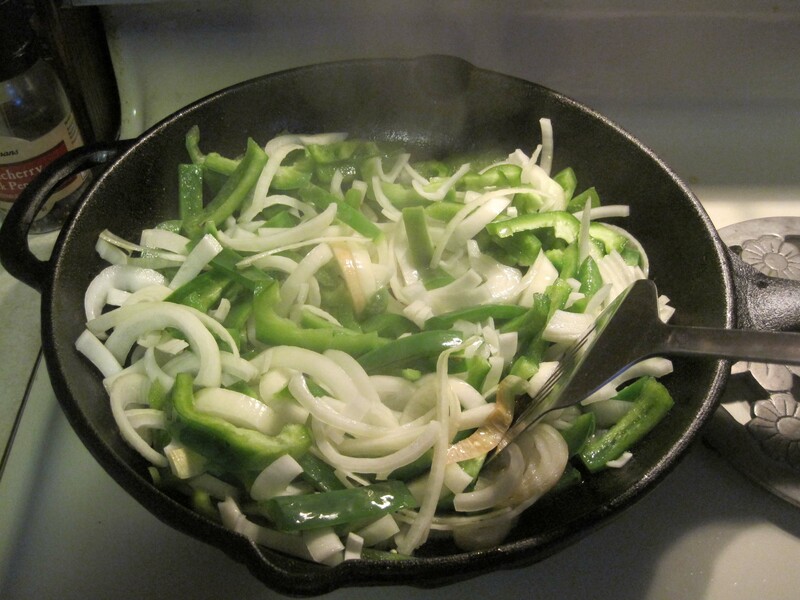 In a cast iron pan, heat oil over Medium-High heat until the oil shimmers. If it begins to smoke the oil is too hot. 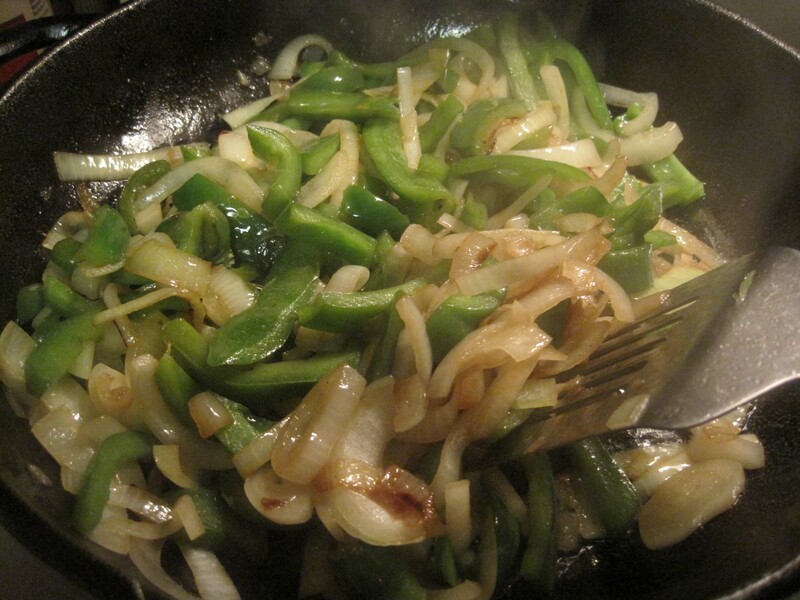 Add peppers and onions and cook, stirring occasionally, until soft (about 5 minutes). Season with salt and set aside. Wipe out pan. On Medium-High heat, add steak to pan and sear on each side for 3 minutes. Turn off the heat and leave steak in the pan 8 minutes longer for medium rare. About 10 minutes for medium. Use the thumb test to check for doneness. Don’t cut into it yet! 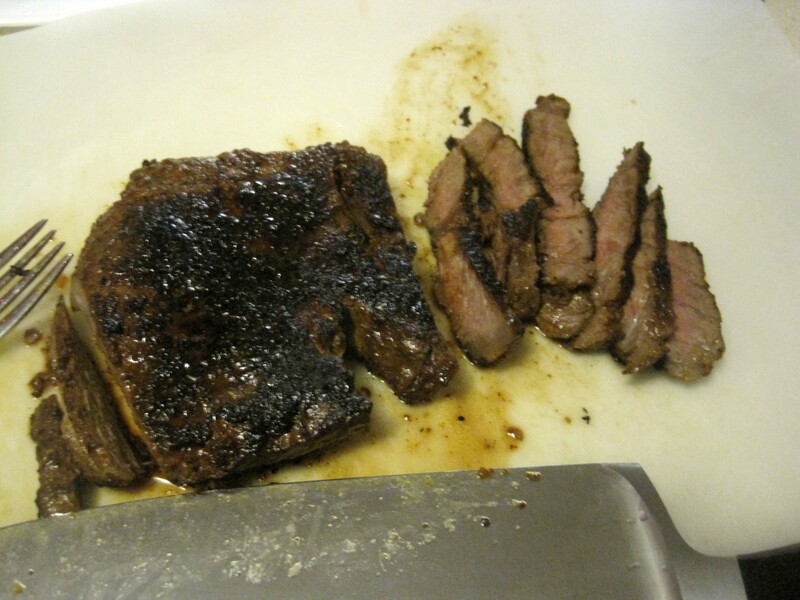 When steak is done to your liking, remove it from the pan to a plate and let it rest for 10 minutes. Meanwhile, prep the lettuce, cilantro, cheese, avocado, salsa, and sour cream. 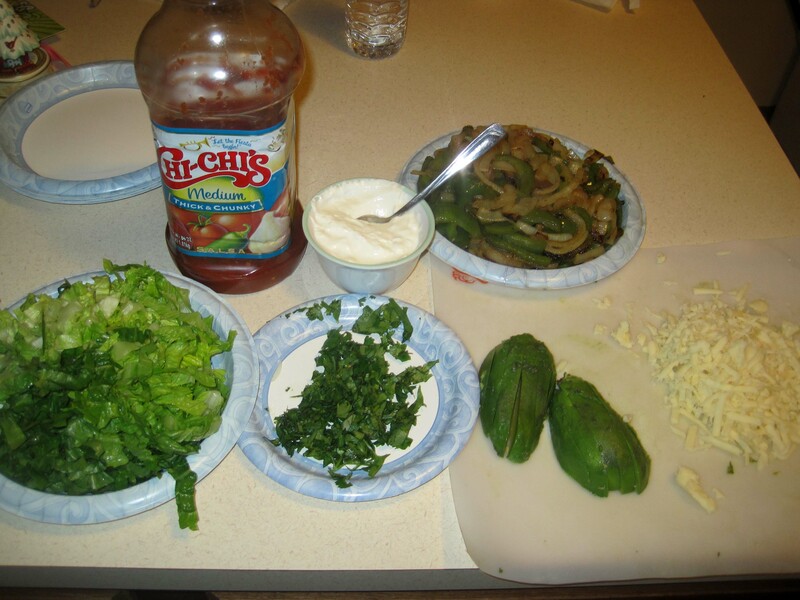 You can mix the sour cream and salsa to make a dressing or just leave them separate. Add a sprinkle of kosher salt to the sour cream (optional). Heat a shallow pool of oil in a small pan over Medium-High heat. 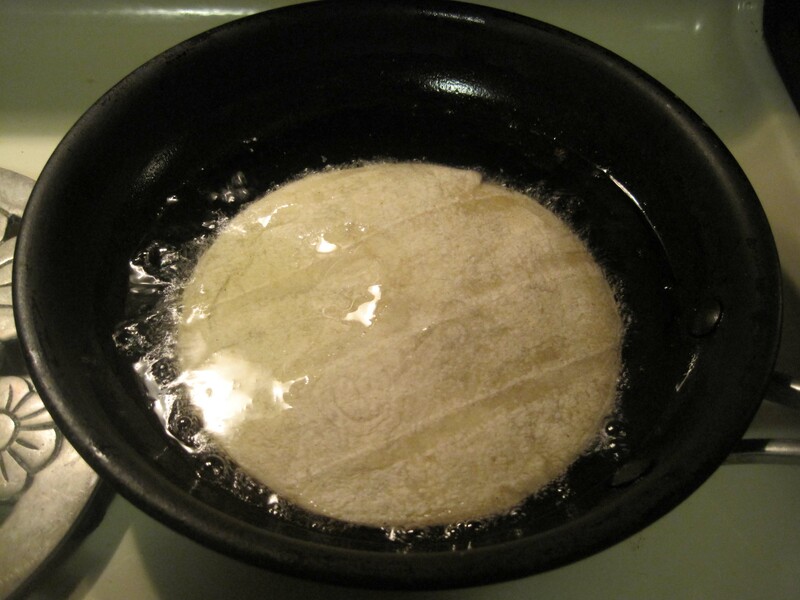 When the oil shimmers, place a corn tortilla in the oil. There should be just enough oil in the pan for the tortilla to float and the oil should bubble excitedly when you introduce the tortilla into it. If it doesn’t get excited it’s not hot enough. 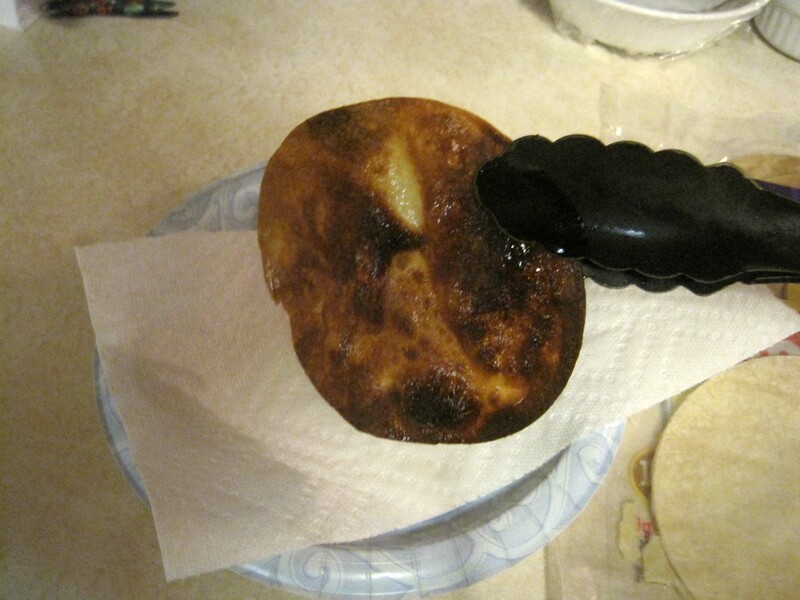 If you notice that your tortilla is getting very dark very quickly or you’re getting smoke the oil is too hot. 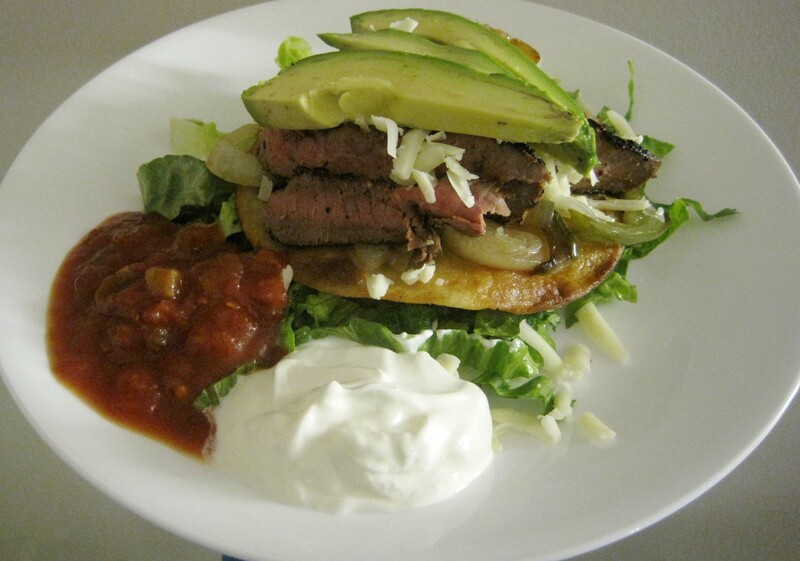 Cook for about 45 seconds on each side or until tortilla is a nice golden brown. Repeat with the other 3 tortillas. Remove to a paper towel lined plate to drain. Slice up your steak thinly. Assemble salad. Lettuce, tortilla, peppers and onions, steak, cheese, avocado, and cilantro to garnish. Serve dressing or salsa and sour cream on the side. Makes 4 main dish salads. A couple nights ago I told my husband I was craving Thai food. If you live in a major metropolitan area that probably sounds like a pretty normal thing. You can get Thai food everywhere nowadays…except here. Where we live we have ONE Thai restaurant. So when I say I want Thai, I’m pretty much saying I want to go to THAT restaurant. It’s a nice little place. It’s downtown, small, quiet, good food, fast service. But going there with four kids? Yeah, no thanks. Taking toddlers into a restaurant is almost invariably a bad idea and we have two of them. We hardly ever go out for exactly that reason so I figured I’d better devise something to make at home to satisfy the craving. 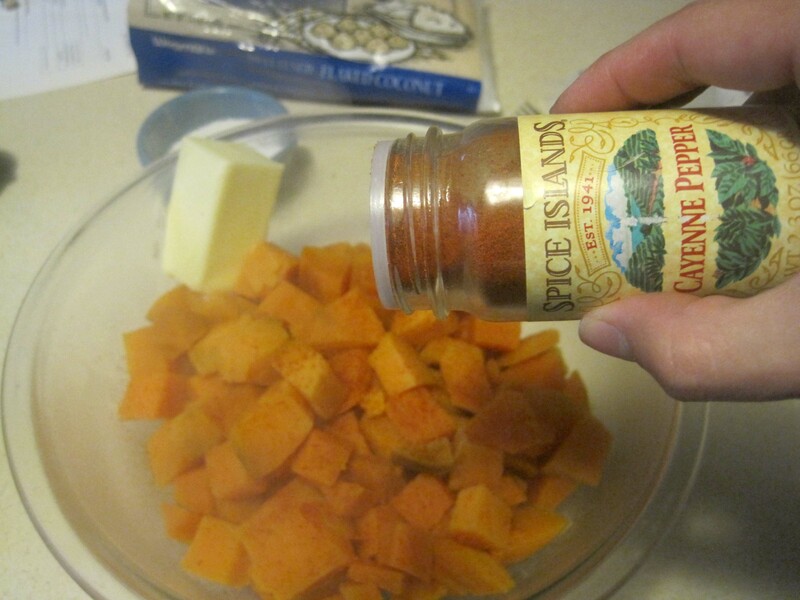 I woke up with the recipe for these sweet potatoes in my head yesterday morning. I usually wake up thinking about cooking. Or eating. FYI. 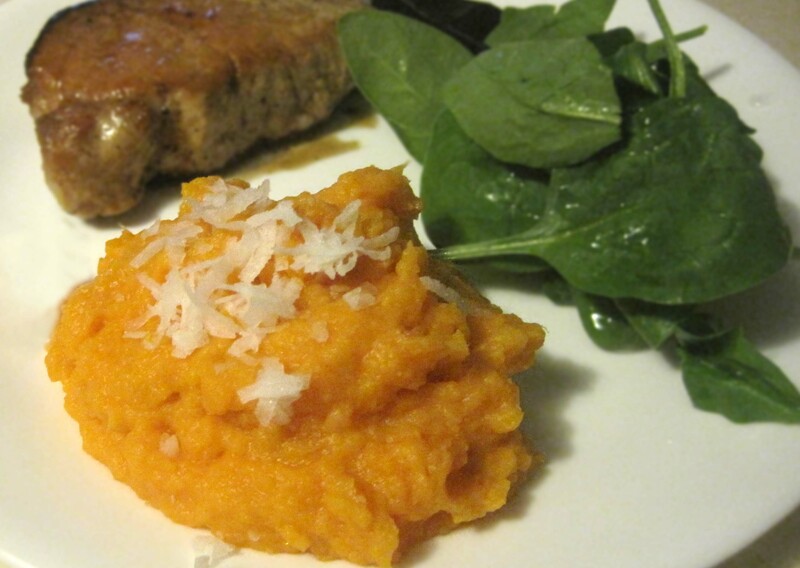 These are not your basic sweet potatoes. In other words, they’re not just sweet. They are much more complex with a really nice flavor balance. Salty and sweet, savory with just a hint of spiciness. Mmm. Comfort food to the max. And so easy to make. After three doctors’ visits in three days, each with all the kids in tow, I needed these big time. And a stiff drink. But that’s a story for another day. 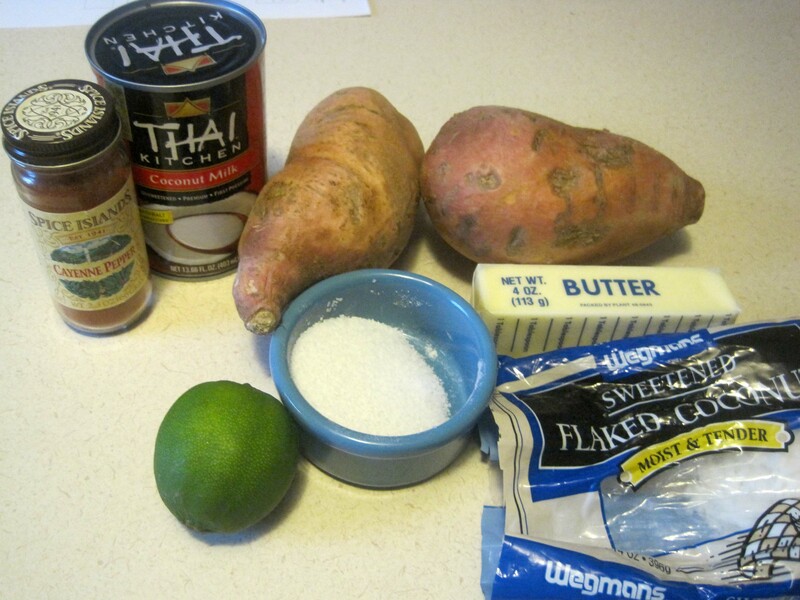 Here’s what you need: 2 medium sweet potatoes (yes, they’re actually yams), butter, salt, sugar (not shown ’cause it forgot to show up for picture day), lime juice, cayenne pepper, coconut milk, and sweetened flaked coconut. 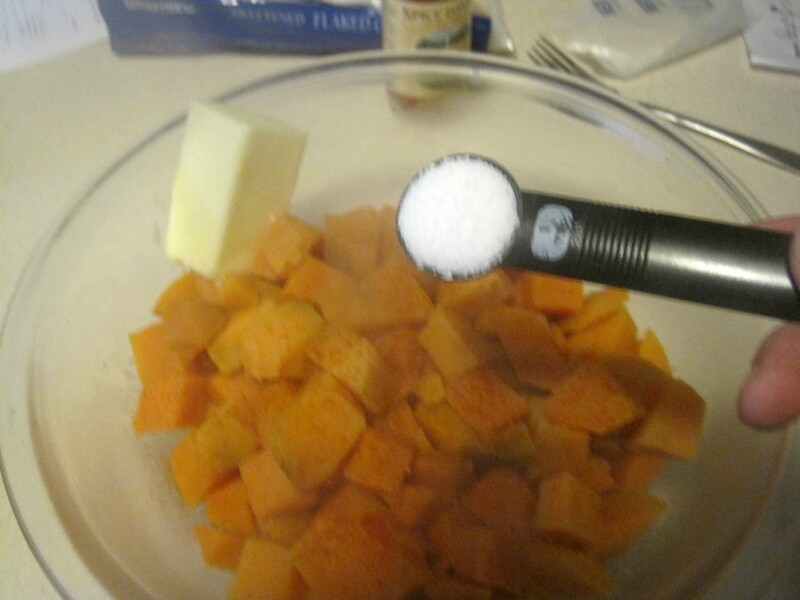 First, peel and large dice up your sweet potatoes. Taking the time to do this in the beginning saves you a lot of cooking time in the end. Next, throw them in a pot of COLD water. (It’s important you don’t throw raw potatoes straight into boiling water. 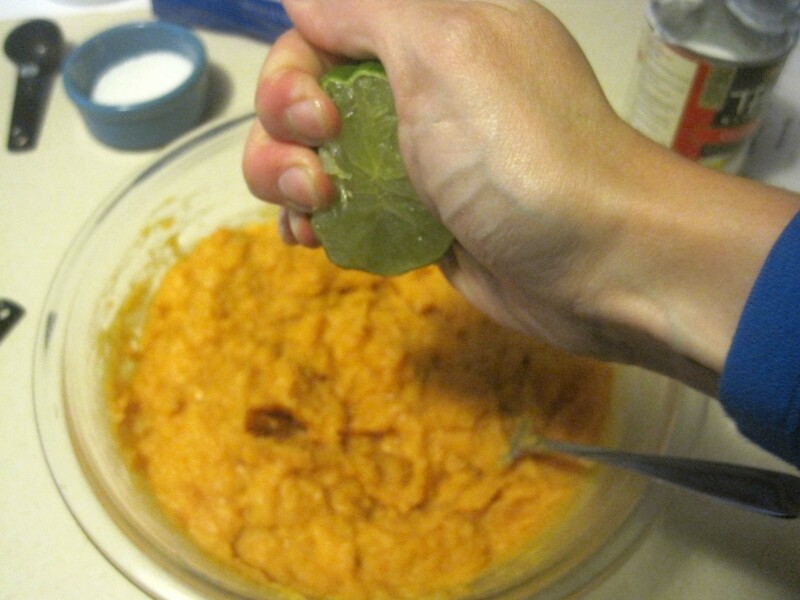 Doing so shocks them into dumping their starch into the water and you end up with gluey mashed potatoes.) Turn the heat up to high and bring them to a boil. 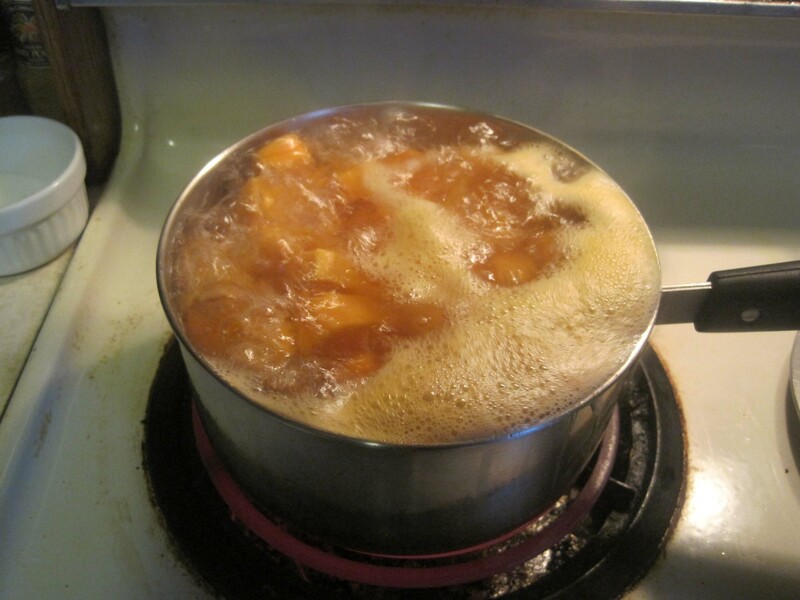 Once boiling, turn down the heat and let simmer about 10-15 minutes or until a fork slides easily into them. 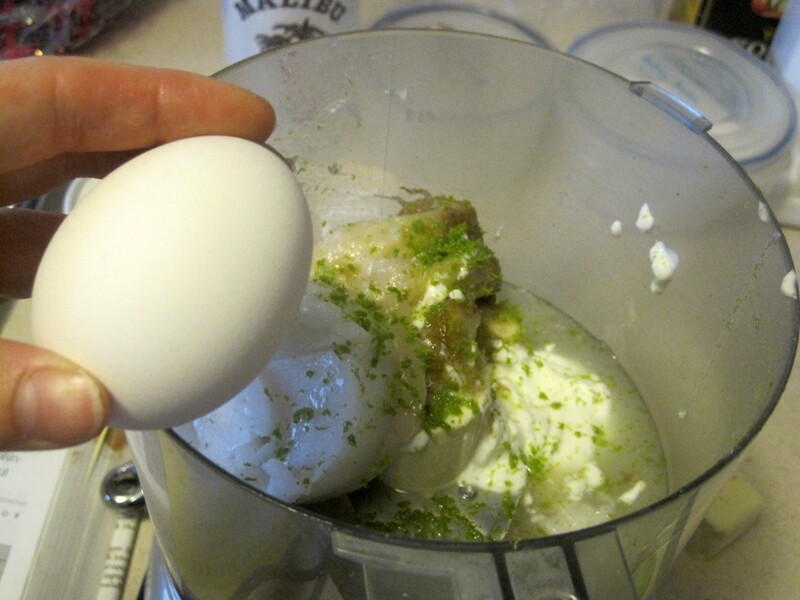 …and 2 tsp lime juice. You can use the bottled kind if you like. You don’t even need half a lime’s worth of juice. I just needed to use this lime before it turned into a green rock in my fridge. And mash it all up. You can use a potato masher if you have one but a fork works just as well. Top with shredded coconut for even more coconuty wonderfulness. 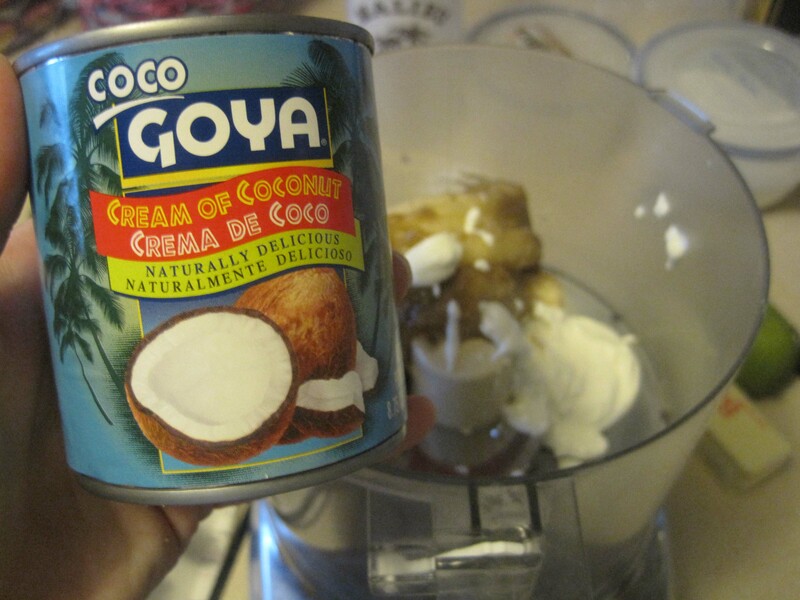 You could also toast the coconut before adding it on if you’re feeling ambitious…which I obviously was not last night. 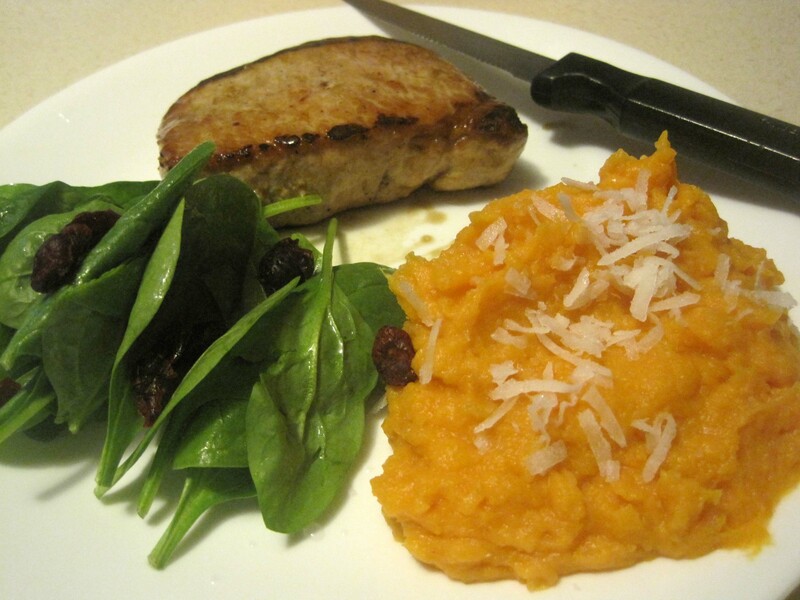 We had it with very simple pork chops and spinach and cranberry salad with balsamic glaze. So beautiful and mouth wateringly yummy. I’m excited I get to eat it again today for lunch. And it came together so quickly and easily – doesn’t get any better than that! 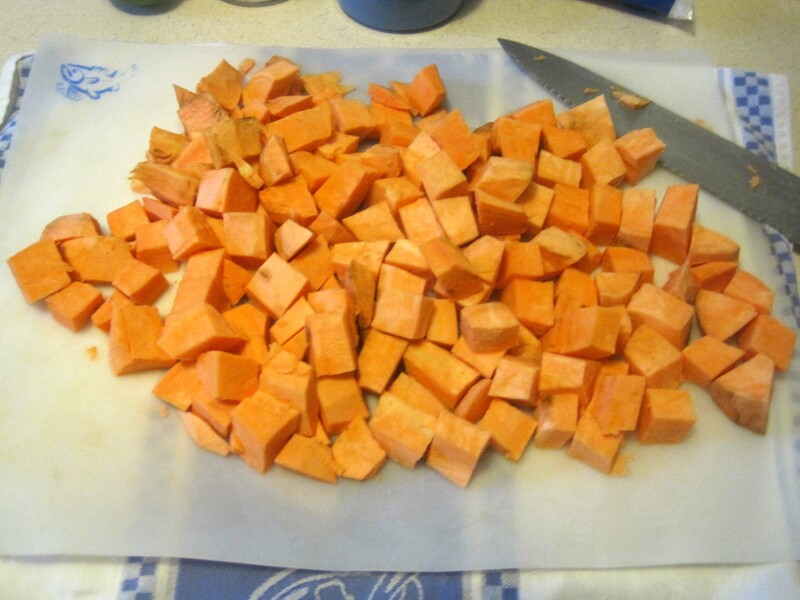 Peel and large dice sweetpotatoes. Add to a pot of cold water. Set over high heat until boiling. 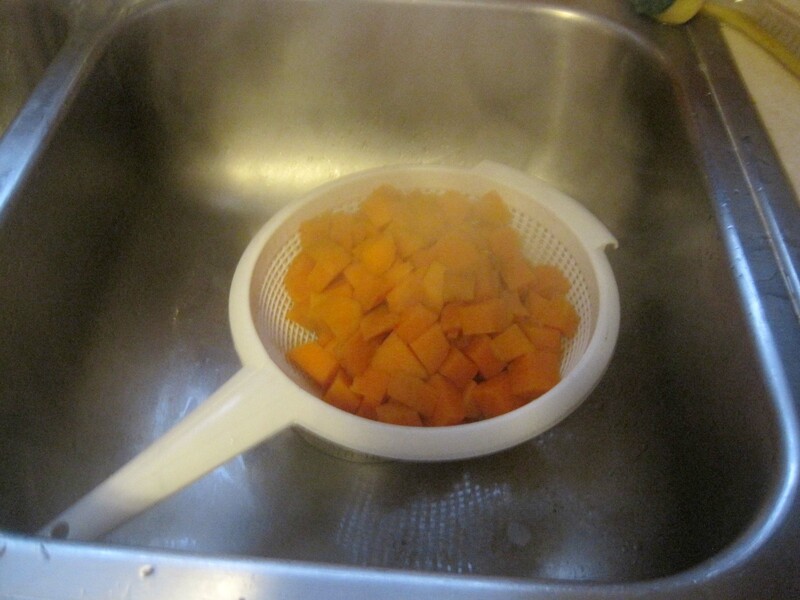 Reduce heat and simmer 10-15 minutes, until sweet potatoes are fork tender. Drain. 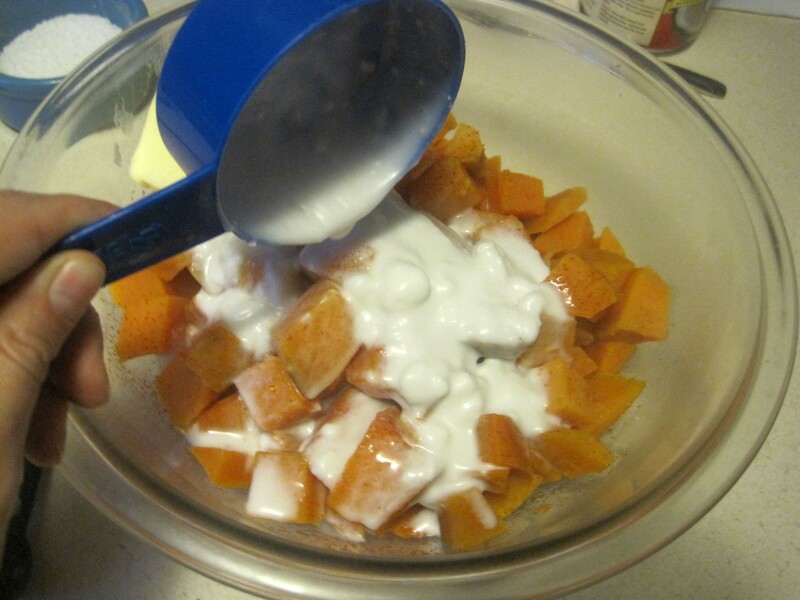 In a medium bowl, combine drained sweet potatoes with butter, coconut milk, sugar, salt, lime juice, and cayenne pepper. Mash to combine. Garnish with flaked coconut and serve hot. I flip flopped over what to call this for a couple of days. You know that sweet corn salsa they have at Chipotle? Well, this isn’t that. But it has many similar elements. Guacamole? Salad? Is it one of those? This doesn’t really fit neatly into any of those categories. But whatever it is it’s GOOD. We used it as a filling for burritos the other night and it was perfect. With a little seasoned chicken or steak or pork and maybe some cheese. Yum. Is it dinner time yet??? Here’s what you need: Two ripe avocados, four plum tomatoes, a handful of cilantro (less than the bunch shown here), a lime, about 1/2 cup of red onion (that little bit was all I had left or I would have used more), a box of frozen corn (thawed), a can of diced green chiles, olive oil, salt, pepper, and sugar. These are all ingredients I use frequently so it was easy to just throw this together with the tacos we were already having for dinner. Well stocked pantry = Happiness. 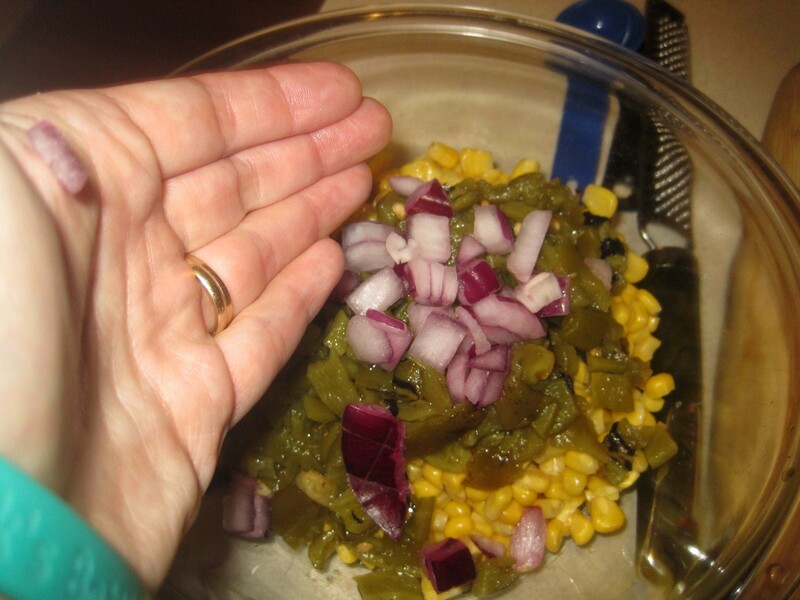 Let’s start with our box of thawed corn and the can of chopped green chiles. If I were feeling more ambitious I would grab a couple of Poblanos and put them on the grill to blacken and remove the skins. 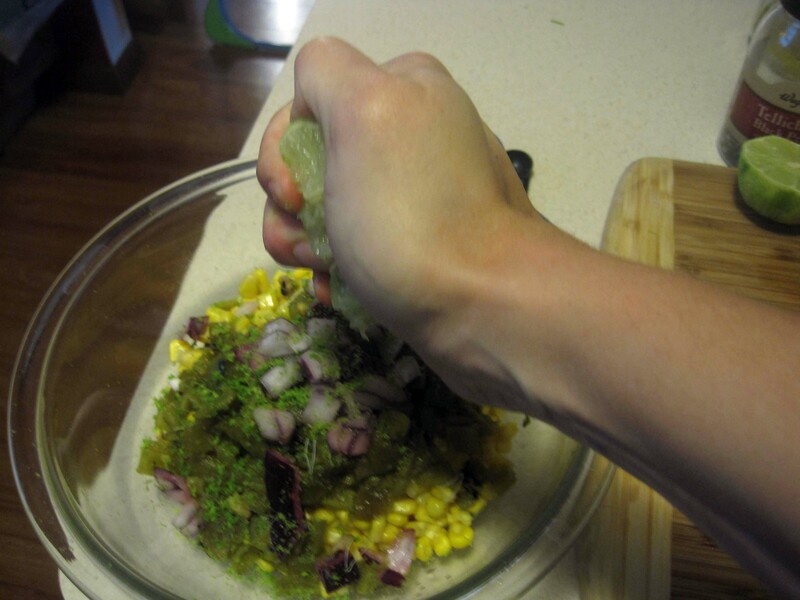 Boil some fresh corn and chop them all up. Oh wait. I would do that if I were feeling more ambitious and it were JULY. As it stands, fresh corn is gone and grilling in the mosquitoey dark is not fun. Add in your chopped red onion. Grab your microplane zester and zest a lime, being careful to take just the limey green zest and not the bitter, white pith underneath. Oh, and also being careful not to zest your poor pinkie finger. Ouch. Look at all that green loveliness in there. 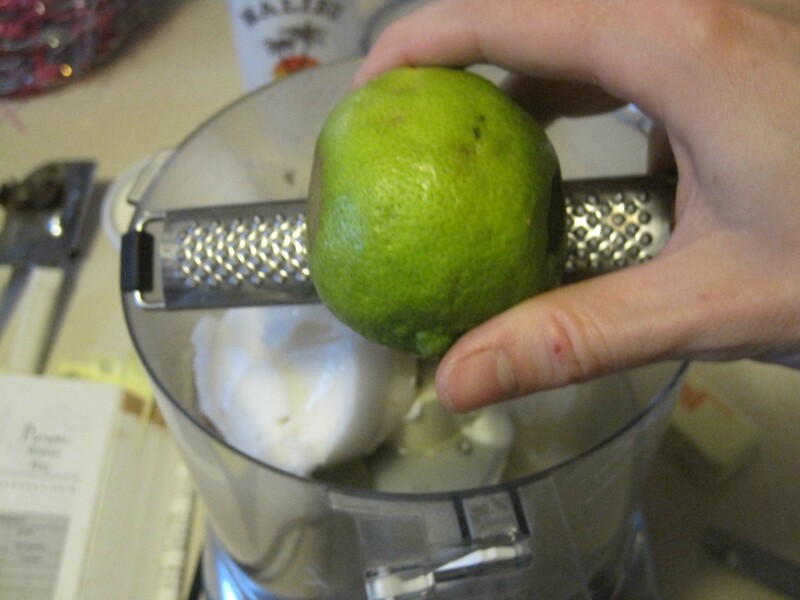 Once your lime is zested, cut it in half and squeeze all that wonderful juice into your bowl. And for God’s sake, if you just zested your poor pinkie, do NOT use that same hand to squeeze acidic juice out of your lime. Yaaaaaaaaaaaauuuuughhh! Ahem…now…grab your salt and pepper and season to taste. How much? A pinch maybe? I don’t usually measure salt and pepper. Err on the side of too little and then taste. I prefer Kosher Salt because it’s more difficult to accidentally over-salt your food. And freshly ground pepper is great if you have a grinder. If not, no big. 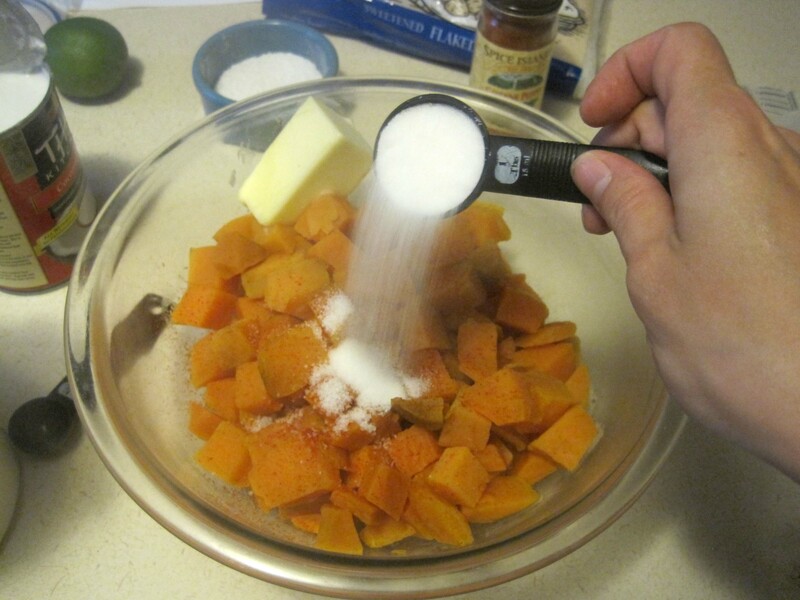 Add 1/2 teaspoon of sugar. And two tablespoons of good olive oil. 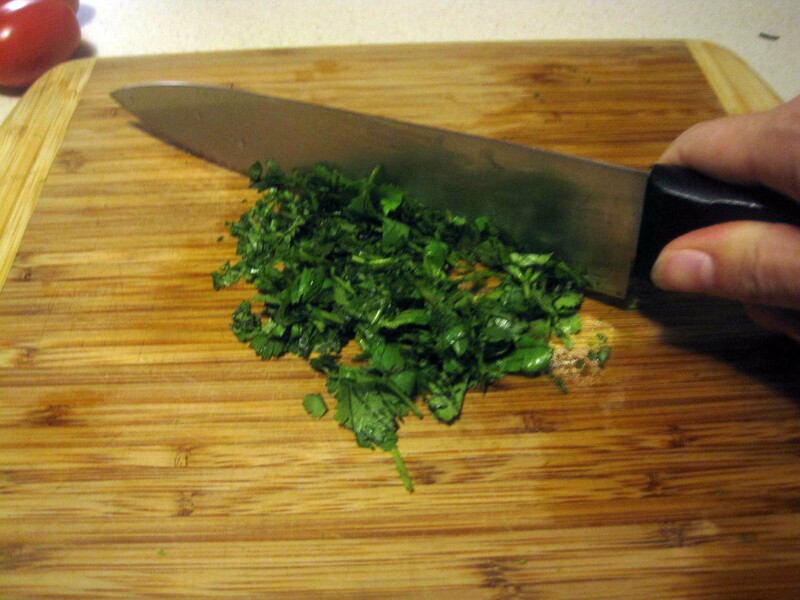 Chop up some fresh cilantro. I never measure cilantro. I find for most things, as much as I can tear off the bunch with one hand works just fine. Chop up your tomatoes and add them as well. 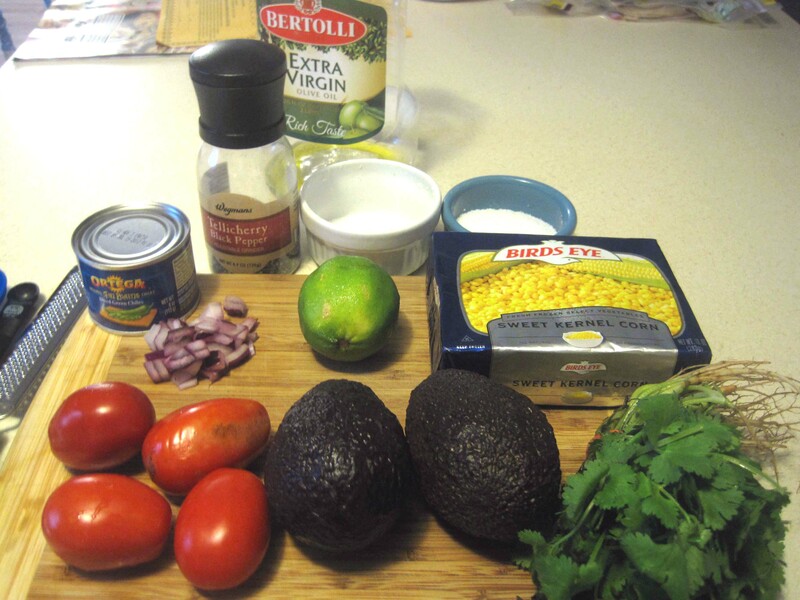 And finally, let’s add in those beautiful avocados. I love when I cut them open on their most perfect day. Just ripe and soft but not turning brown inside yet. It’s a short window. That perfect day is approximately the day they turn black. And maybe a day and a half after that at most. It’s all downhill from there. If you can, try to find the greenest Haas avocados in the produce section. Often when you buy a black one it looks like it will be good, but then you get it home and find it’s all brown and abused looking inside. No thanks. Anyway – easiest way to remove the pit without sacrificing any of the precious green stuff is to (carefully) slam your chef’s knife into the pit, exert a little bit of pressure, and then rotate the pit out. Then (again, carefully), bang the handle of your knife into the edge of the counter and the pit will release and fall wherever you have planned for it to go. The garbage disposal is not the best place. Word to the wise. 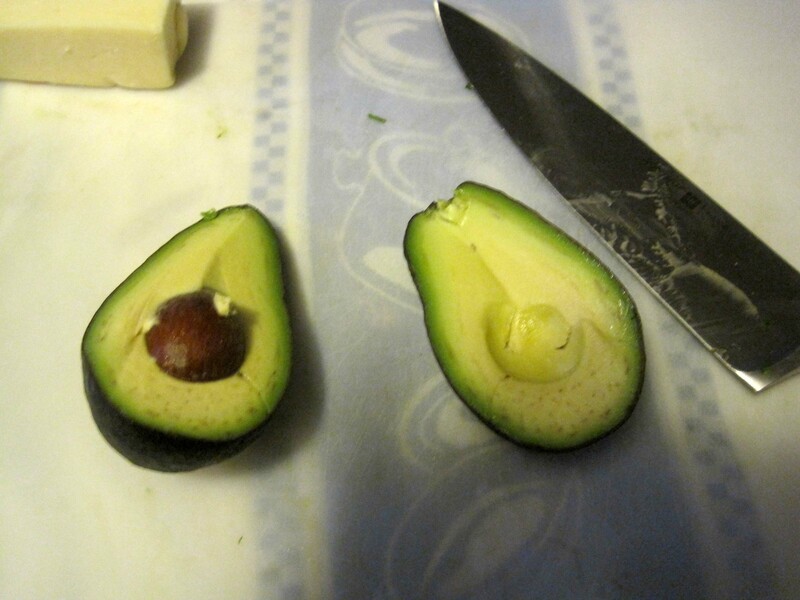 Use a spoon to separate your beautiful avocado halves from their skins. Discard the skins. Chop them up into bite size pieces and add them into your salsa. Oh, and, I should probably mention now, just like guacamole, this is something you want to make shortly before you’re going to serve it. 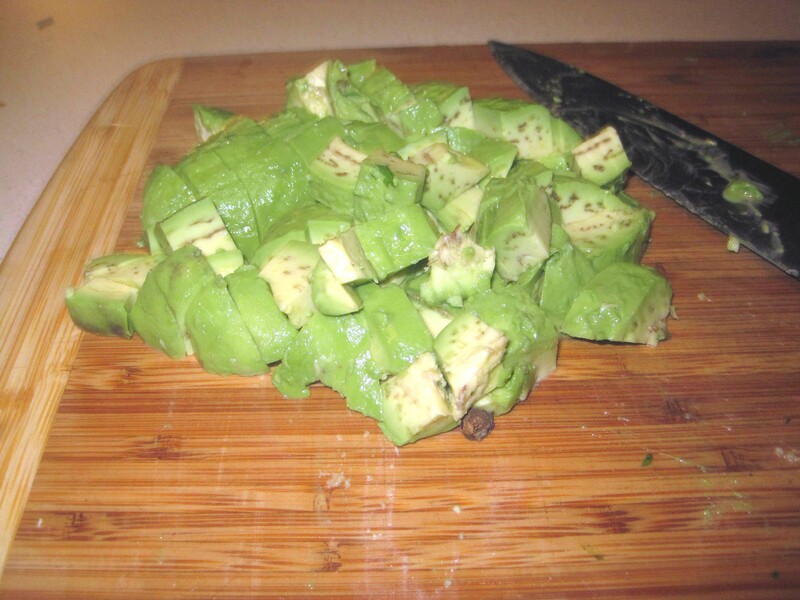 The second you cut into an avocado, oxidation begins to turn it brown. It’s not like it will be inedible but it will be unappetizing after a few hours time. 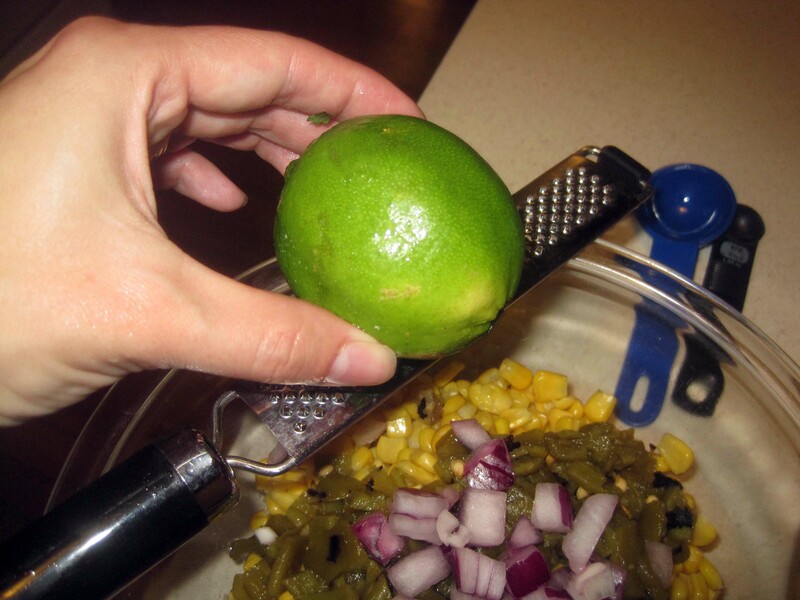 The lime juice helps slow that process, and certainly covering it well by pressing plastic wrap down directly onto the salsa will help – but avocado brownage is as inevitable as death and taxes…so…don’t put off until tomorrow what you can eat today. All right, I’m done with cheap, throw away advice. You’re on your own now. And there we have it! So colorful, so flavorful, and so amazingly good for you! You could eat this with chips, in burritos, or with a spoon. It’s just splendid. All the flavors play off each other so nicely. 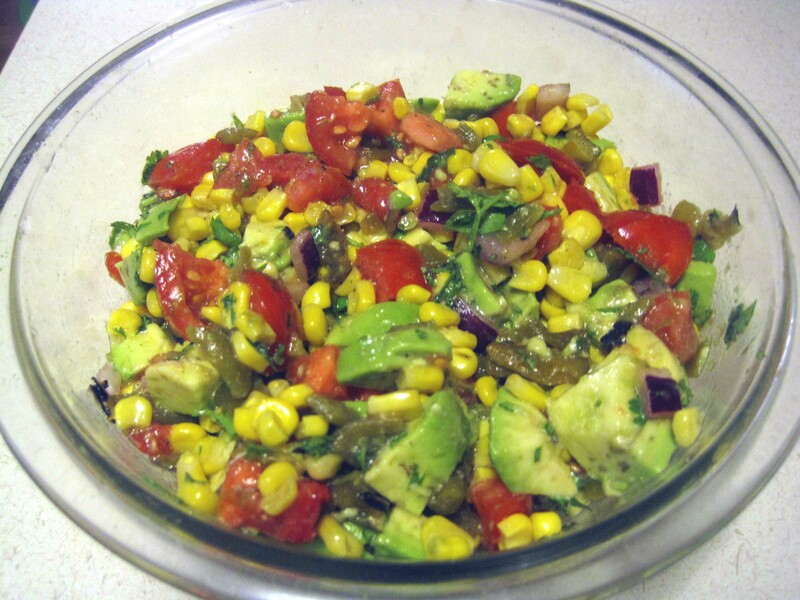 The creamy mild avocados, the sweet corn, tart lime, pungent red onions, firm, juicy tomatoes, bright fresh cilantro, the chiles adding just a touch of heat. Mmm. Simply awesome. Go make some tonight! Combine all ingredients in a medium sized bowl and serve promptly.